Fiduciaries perform a wide range of functions in the New York courts. Courts, for example, appoint fiduciaries as guardians for incapacitated persons, as receivers for properties involved in foreclosure proceedings and as guardians ad litem for children involved in litigation. Fiduciary appointees are usually private attorneys, who are paid for their services from the assets of the litigants. The fiduciary appointment process has been the target of extensive public criticism over the years, with charges that judges have selected fiduciaries based on factors other than merit and complaints that fiduciary appointees have mishandled cases or received excessive fees from their assignments. Following widely publicized allegations regarding the connection between political party service and receipt of fiduciary appointments in Brooklyn Supreme Court, Chief Judge Judith S. Kaye last year announced a broad program to reform the State's fiduciary appointment process. She created a high-level Commission on Fiduciary Appointments to examine existing rules and practices and make recommendations for improvement. She also established an Office of the Special Inspector General for Fiduciary Appointments, with jurisdiction to monitor and enforce existing rules governing the appointments. This report is based on a comprehensive investigation, involving hundreds of interviews and examination of thousands of court files, by the Office of the Special Inspector General and the court system's Internal Auditing Unit. Most of the individuals involved in the cases discussed in the report were interviewed. The findings have been shared with the Commission on Fiduciary Appointments, which will be releasing its own report and recommendations shortly. The findings are being released now so that the public can more fully understand the basis upon which many of the Commission's recommendations are being made and better evaluate its proposed reforms of fiduciary appointment rules and practice. The cornerstone of regulatory oversight of the fiduciary appointment process is Part 36 of the Rules of the Chief Judge. Under Part 36, individuals seeking appointment as a fiduciary must submit an application to the Office of Court Administration (OCA). OCA compiles lists of the applicants, which are made available to the judges. Anyone is eligible for inclusion on the lists, except a relative within the sixth degree of relationship of a Unified Court System judge. The rules contemplate that judges will make fiduciary appointments from the lists, although a judge may deviate from the lists in certain circumstances. Part 36 also requires appointees, prior to accepting an appointment, to file with the court a written certification that: (1) the appointee is not related to a judge within the sixth degree of relationship; and (2) the appointment will not result in the appointee receiving within a 12-month period more than one appointment in which the anticipated compensation will exceed $5,000 (the "$5,000 rule"). Within ten days of appointment, appointees must file a notice of appointment with OCA. Additionally, when a judge approves payment greater than $500 to a fiduciary, the judge must file with OCA a statement of approval of compensation specifying the amount. Under the rules, judges are not authorized to approve payment unless the fiduciary appointee has filed the written certification and the notice of appointment. OCA enters information from these filings in the court system's fiduciary database, which is electronically available to judges (along with the applications submitted by fiduciaries and the lists of the applicants). This information is also available to the public. Given the thousands upon thousands of fiduciary appointments made in the New York courts each year, it was not possible to review all cases in which appointments were made. Rather, the investigation focused on a representative number of cases in a representative group of jurisdictions throughout the State. The review concentrated on guardianship cases and receivership cases in Supreme Court and guardian ad litem appointments in Surrogate's Court. When a petition for a guardianship is brought, the court must appoint a court evaluator or counsel for the alleged incapacitated person to assist the court in its determination of whether a guardian should be appointed. A guardian will be appointed if the court determines that the individual is incapacitated because he or she is unable to provide for personal needs or property management (or both) and cannot adequately appreciate the nature and consequences of the inability. Even in the counties with the best rate of filing compliance, forms were filed in less than half of the cases. A guardian and an employee of the guardian's law firm billed $850 to celebrate the IP's birthday when they brought her flowers and a cake and visited with her at the nursing home. On another occasion, when the guardian and one of his employees visited the IP at the nursing home, they took her out for a walk and bought her an ice cream cone. The guardian billed $1,275 for this visit. Another guardian received over $65,000 in compensation based on the guardian's billing rate for legal services for tasks that included visiting an eyeglass store, attending a holiday party, inventorying the IP's wardrobe and sewing and ironing labels on the IP's clothing. Another guardian received over $12,000 for services that included shopping for clothes, handling routine banking matters and attending medical appointments with the IP. A closer examination of several selected guardianship cases revealed that the guardians apparently did not always act in the best interests of their wards. Serious lapses were found in the quality of care that guardians provided in meeting the personal needs of the IPs. Moreover, guardians apparently did not always strive to promote and preserve the IPs' financial interests, as they were obligated to do as fiduciaries. An attorney who received over 10 appointments and approximately $250,000 in compensation from a judge for whom the attorney regularly served as a non-paying special master. The attorney, who appeared to lack the qualifications for these appointments, had twice declared bankruptcy. Several individuals who received appointments from judges for whom they had provided free legal and other professional services. Two attorneys with high-level positions in a local political party who received approximately 110 appointments between them in guardianship and receivership matters and were awarded compensation of approximately $400,000. Our review also uncovered a significant number of individuals who received more than one appointment within a 12-month period for which they ultimately were paid more than $5,000, an apparent violation of the Part 36 rules. Compliance with the Part 36 filing requirements was extremely poor in receivership cases: · In a number of jurisdictions there was minimal filing, particularly with regard to statements of approval of compensation. Even in counties with a better showing, there was barely compliance in a third of the cases. An official of the local political party organization received 46 receivership appointments during a five-year period (about 10% of all the receivership appointments), and about one-third of all receiver fees during that period. A law firm, one of whose two members was a high-ranking local political party official, received 34 appointments during the same five-year period. In general, and contrary to the requirements of the Part 36 rules, receivers, and not judges, appointed their counsel or property managers. Indeed, the general practice across the State was not to apply the fiduciary rules to these "secondary" appointees. One extreme result of this practice was that, in one jurisdiction, a single, small law firm obtained approximately 75% of all counsel to receiver assignments over a five- year period, amounting to over $700,000 in fees. If the rules had been followed, two of the three lawyers in that firm would not have been eligible for even a single assignment because they were the sons of a current Supreme Court Justice. Another result of this practice was that, over a five-year period in one county, two management companies received 76% of all property manager appointments and 84% of all fees awarded from such appointments. Although counsel were routinely retained in receivership cases, our investigation revealed that the work they performed often was not of a legal nature, involving tasks that the receiver should have been performing such as preparing accountings, preparing billings and meeting with tenants and property managers. Because receivers are compensated at the statutory rate of a maximum of five percent of the amounts they receive and disburse, and the counsel are compensated at their hourly legal rates, the result was that in the smaller receivership cases (which made up the great number of the cases) usually the counsel were awarded higher fees than the receivers. Moreover, in many cases the counsel were compensated for the full amounts they requested even though they failed to detail the work they performed. Similarly, receivers frequently failed to specify expenditures they made, and in some cases they were paid fees that exceeded the five percent statutory maximum. In some counties, 80% or more of the required forms were filed. In a few counties, however, forms were filed in only half of the cases. In one county, where roughly 100 attorneys received guardian ad litem appointments in the year we examined, a group of 11 attorneys received 40% of the appointments and nearly half of the total compensation awarded. In one case that we carefully examined, involving an unusually large estate, the court appointed a retired County Court Judge as guardian ad litem and a retired Surrogate as special referee. The retired County Court Judge hired as his assistants two attorneys--his daughter and the county's deputy public administrator (a close friend of the Surrogate). All told, the combined fees paid to the appointees and the assistants were nearly $1.5 million. Additionally, a significant number of attorneys received guardian ad litem appointments in apparent violation of the $5,000 rule. Despite the extensive problems found, we are confident that significant reform of the fiduciary appointment process is underway. First, the Commission on Fiduciary Appointments is about to release its report and recommendations, which will directly address concerns we have raised. Second, to correct the widespread flaws in the fiduciary filing process, the court system has already implemented a new oversight system involving designation of special fiduciary clerks and close monitoring of all aspects of this process. This will better ensure that forms are properly -filed and that fiduciaries are not paid unless the required filings are made. Third, clear violations of the fiduciary rules and ethical standards that we have identified have resulted in referrals to appropriate disciplinary authorities. This is sending strong message to the bar and bench that violations of these important rules will not be tolerated. Finally, the Office of the Special Inspector General has been established as a permanent entity within the court system, and we are continuing our efforts to promote compliance with the fiduciary rules and facilitate greater public confidence in the fiduciary appointment process. Courts have long relied on fiduciaries to perform a range of functions in our justice system. For example, courts appoint fiduciaries as guardians for incapacitated persons, as guardians ad litem for children involved in litigation and as receivers for properties involved in foreclosure proceedings. Fiduciary appointees are usually private attorneys, but unlike private attorneys who are assigned to represent indigent persons in criminal, family and other proceedings, fiduciaries are not compensated with public funds. Rather, they are usually paid from the assets of the litigants. Allegations that judges have selected fiduciaries based on factors other than merit have undermined public confidence in our courts, as have charges that fiduciary appointees have mishandled cases or received excessive fees from their assignments. Criticism of the fiduciary appointment process soared recently with the public disclosure of an extraordinary letter written by two attorneys who had been retained but then dismissed as counsel to a court-appointed receiver in a Brooklyn Supreme Court proceeding. The letter laid bare the long-suspected influence that political connections can have on the fiduciary appointment process. This time, however, the allegations of political influence came from an unlikely source--disgruntled attorneys seeking to perpetuate their receipt of fiduciary appointments, which they considered their entitlement based on their service and loyalty to the county political organization. In the wake of these developments, Chief Judge Judith S. Kaye announced a comprehensive program to reform the fiduciary appointment process in New York. She directed the establishment of an Office of the Special Inspector General for Fiduciary Appointments, with Statewide jurisdiction to monitor and enforce the existing rules governing judicial appointments. She also created a high-level Commission on Fiduciary Appointments to examine existing fiduciary rules and make recommendations for improvement. This report is based on a far-reaching investigation conducted by the Office of the Special Inspector General for Fiduciary Appointments and the Unified Court System's Internal Audit Unit. As part of this investigation, we have examined thousands of court files and conducted hundreds of interviews with individuals directly involved in or knowledgeable about the process of appointing fiduciaries. Most of the individuals involved in the cases discussed in the report were interviewed. We have also reviewed extensive information in the Unified Court System's fiduciary appointment database. Comprehensive investigation of the fiduciary appointment process is a huge undertaking--in any given year, thousands upon thousands of fiduciary appointments are made in the New York courts. We have not examined all of these appointments, nor would it be possible to do so. What we have done in this report is present our findings with regard to a representative group of cases and jurisdictions. In doing so, we have identified a series of problems and concerns that require the attention of court administrators, policy makers and, perhaps most importantly, the Commission on Fiduciary Appointments, which will be issuing its report and recommendations in the next several days. The Commission's report will include recommendations for rule changes that will be considered by the Administrative Board of the Courts and ultimately by the State's highest court, the Court of Appeals. Throughout our investigation, we have shared our findings with the Commission. This report is being released now so that the public will understand the basis upon which many of the Commission's recommendations are being made and thus can better evaluate the forthcoming proposed changes in fiduciary appointment rules and practice. referrals currently under consideration. The law provides that these are confidential processes in which the subjects are not revealed unless they waive their statutory right to confidentiality or unless a finding of misconduct is made. Although many have long urged that disciplinary charges against judges and lawyers be made public at an earlier point, as of yet there has been no legislative action in that regard. The cornerstone of regulatory oversight of the fiduciary appointment process in New York is Part 36 of the Rules of the Chief Judge (see 22 NYCRR Part 36). Promulgated in 1986, the Part 36 rules apply to the appointment of guardians, guardians ad litem, court evaluators, attorneys for alleged incapacitated persons, receivers, persons designated to perform services for a receiver and referees. Under the rules, individuals interested in being considered for appointment must submit an application to the Office of Court Administration. OCA compiles lists of the applicants, which are made available to judges who must make the appointments (§ 36.2(a)). Anyone is eligible for inclusion on the lists, except a person who is a relative of, or related by marriage to, a judge of the Unified Court System within the sixth degree of relationship (§ 36.1(b)(1)).1 Thus, although the application that a prospective fiduciary appointee submits to OCA contains extensive information about the applicant, such as prior experience, education, employment history, area of expertise and criminal record, the only factor that renders an applicant ineligible for inclusion on the list is relation to a judge within the sixth degree. The rules contemplate that judges will make fiduciary appointments from the list. A judge may deviate from the list, however, if the appointee "is better qualified for appointment in a particular matter, either because of prior experience with the ward or estate, or because of particular expertise necessary to the case." When deviating from the list, the judge must place the reasons for doing so as well as the appointee's qualifications on the court record (§ 36.1(a)). The rules provide generally that the appointing judge is "solely responsible" for determining the qualifications of a fiduciary appointee. Part 36 sets forth strict filing requirements for fiduciaries. Before accepting an appointment, a prospective appointee must file with the court a written certification that the appointment will not violate the Part 36 rules (UCS Form 830.3; see § 36.1(d)). In essence, this is a certification of two facts. First, as noted, it is a certification that the prospective appointee is not related to a judge within the sixth degree. Second, it is a certification that the appointment will not result in the appointee receiving within a 12-month period more than one appointment, calculated from the date of appointment, in which the anticipated compensation will exceed $5,000. The prospective appointee's certification must also include a list of any fiduciary appointments received within the preceding 12 months. If the appointee is unable to make this certification, the judge is not authorized to make the appointment, with one limited exception. The judge may waive the $5,000 rule upon determining, in writing, that "unusual circumstances of continuity of representation or familiarity with a case require" the appointment (§ 36.1(c)). Within ten days of receiving an appointment, the fiduciary must file with OCA a "notice of appointment" form (UCS Form 830.1; see § 36.3(a)). The filing provisions, however, do not apply to every fiduciary appointee. Section 36.1(e)(3) provides that the provisions do not apply to the Mental Hygiene Legal Service, a nonprofit institution performing social services or an appointment of a relative or a person having a legally recognized duty or interest with respect to the affairs of the infant, ward, incapacitated person, decedent or beneficiary of an estate. When the judge approves payment in excess of $500 to any fiduciary, including family members and social service agencies, the judge must file with OCA a "statement of approval of compensation" specifying, among other things, the amount of compensation authorized (UCS Form 830; see Jud. Law § 35-a, 22 NYCRR Part 26).2 The statement of approval of compensation also includes a certification by the fiduciary that he or she submitted a notice of appointment form to OCA, and a certification by the judge that the fee authorized is fixed by statute or is a "reasonable award" for the services rendered (§ 26.4). The rules further provide that no fee shall be awarded unless the fiduciary has filed the notice of appointment form and the certification of compliance (§ 36.4(c)). OCA enters information from these filings in the Unified Court System's fiduciary database, which, along with the applications submitted by prospective fiduciaries and the lists of the applicants, is now available to judges on the Judiciary's internal computer network. This information is also available to the public. Since its promulgation in 1986, Part 36 has included within its ambit "persons performing services for a receiver." Section 36.1(a) provides that their appointments, like those of receivers, guardians and the other fiduciaries enumerated in that section, "shall be made by the judge authorized by law to make the appointment." All of the disqualifying factors, filing requirements and other provisions of Part 36, therefore, apply with equal force to such persons. Thus, receivers cannot appoint their own counsel or property managers, judges may not appoint relatives of judges to those positions and the appointees must make all the filings required by Part 36. Despite the clear mandate of Part 36, a practice evolved in the courts in which the receivers, and not the judges, selected their own counsel and property managers in cases in which the receivers determined it was advantageous to retain these professionals. To correct this widespread noncompliance with the rules, Chief Administrative Judge Jonathan Lippman in March 2000 issued a memorandum reiterating for judges across the State that appointments of persons designated to perform services for a receiver must be made by the judge, and that such appointments were subject to all the requirements of Part 36 (see Attachment A). The Rules of Judicial Conduct also address fiduciary appointments. The rules provide that a judge "shall not make unnecessary appointments . . . . shall avoid nepotism and favoritism . . . . [and] shall not approve compensation of appointees beyond the fair value of services rendered" (22 NYCRR § 100.3(C)(3)). The rules also provide generally that a judge "shall act at all times in a manner that promotes public confidence in the integrity and impartiality of the judiciary," and "shall not allow family, social, political or other relationships to influence the judge's judicial conduct or judgment" (22 NYCRR §100.2(A) & (B)). A court may appoint a guardian only after determining that the appointment is necessary to provide for the personal needs of that person and/or to manage the property and financial affairs of that person, and that the person has agreed to the appointment or is incapacitated (MHL § 81.02(a) (1) & (2)). The standard in determining incapacity is whether the person is likely to suffer harm because he or she: (1) is unable to provide for personal needs or property management or both, and (2) cannot adequately understand and appreciate the nature and consequences of the inability. A determination that a person is incapacitated must be based on clear and convincing evidence, and requires a hearing, even in cases where the alleged incapacitated person (the "AIP") consents to the appointment of a guardian (MHL § 81.11(a)). The court also must assess the functional abilities of the AIP in order to properly tailor the guardianship order so that it meets the needs of the individual (MHL § 81.02(c)). A guardianship proceeding (often referred to as an Article 81 proceeding) begins with the filing of an order to show cause and supporting petition. The majority of guardianship petitions are filed by local social services agencies, hospitals and healthcare facilities, with most of the remainder brought by relatives or friends of the AIPs. At the time of issuance of the order to show cause, the court must appoint a court evaluator (unless counsel for the AIP is appointed) (MHL § 81.10 (g)). Court evaluators must be selected from the OCA fiduciary list. In addition, all court evaluators must complete a training program approved by OCA. Although the court may waive this training, that is rarely done (MHL § 81.40(c)). In selecting a court evaluator, the court may choose from a broad spectrum of professions, including attorneys, physicians, psychologists, accountants, social workers, nurses or any other persons the court determines possess the knowledge and skill to perform the task (MHL §, 81.09(b)(1)). Additionally, in cases in which the AIP resides in a state facility, hospital, nursing home or adult home, the court has the option of appointing Mental Hygiene Legal Service ("MHLS") as the court evaluator (MHL § 81.09(b)(2)). The court evaluator acts as an independent investigator and gathers information to aid the court in its determination of the AIP's capacity, the availability and reliability of alternative resources, the proper powers to be assigned to the guardian and selection of the guardian (MHL § 81.09). The court evaluator's specific responsibilities include meeting with and interviewing the AIP to explain the proceedings, the rights to which the AIP is entitled, and the general powers and duties of a guardian. The court evaluator also must interview the petitioner, assess whether legal counsel should be appointed for the AIP and submit a written report providing extensive information with recommendations to the court (MHL § 81.09(c)(5)). All of these tasks must be performed on an expedited basis, because the court must conduct a hearing within 28 days of the filing of the petition (MHL § 81.07(a)(1)). An AIP for whom a guardianship is being sought has the right to be represented by legal counsel of that person's choosing (MHL § 81.10). Although the court also may appoint counsel for the AIP, this is not always required. Appointment of counsel is mandatory, however, if: (1) the AIP requests counsel; (2) the AIP contests the petition; (3) the AIP does not consent to a request in the petition for removal to a nursing home or other residential facility; (4) the AIP does not consent to necessary medical or dental treatment; (5) the petition seeks temporary powers; (6) the court determines that a conflict exists between the court evaluator's role and the advocacy needs of the AIP; or (7) counsel would be helpful to the resolution of the case (MHL § 81.10(c)). A guardian may exercise only those powers authorized in the appointment order, which must be tailored to the specific needs of the IP. In general, a guardian usually is required to oversee the IP's assets, make health care and medical decisions, pay bills, supervise home health care or select a health care facility, and periodically visit the IP. In addition to providing personal care and managing the IP's finances, the guardian must file periodic reports with the court. These reports should document the IP's financial status, including income, assets, expenditures and unpaid claims, as well as medical condition and health care. The reports are reviewed by court examiners who have been appointed by the Appellate Division (MHL § 81.32). Upon the termination of a guardianship, the guardian must file with the court a final report providing a financial accounting of the entire period during which the guardian served. Article 81 prescribes how the court evaluator, counsel for the AIP and guardian are to be compensated (MHL §§ 81.09(f), 81.10(f) and 81.28). Under the statute, the cost of the guardianship proceeding is to be paid by the IP, unless he or she has minimal or no assets. However, if the proceeding is dismissed or discontinued and the court determines that appointment of a guardian is not warranted, the petitioner is usually responsible for his or her own attorney's fees and possibly even the fees of the court evaluator and counsel to the AIP. If an AIP is indigent, the Court of Appeals has held that the cost of attorney fees should be borne by the county pursuant to Article 18-B of the County Law.4 And in cases commenced by local social service agencies in which there are minimal or no assets, the court evaluator receives a stipend of $600, to be paid by the petitioner. Typically, if the AIP has some or substantial assets, the court evaluator and the counsel for the AIP are paid a fee from those assets based on the fair and reasonable value of the services rendered. When determining reasonable compensation for a court appointee, the court generally must consider the following factors: time spent, difficulty involved, nature of the services, amount of assets involved, professional standing of the counsel and results obtained.5 In making this determination, the court should rely on detailed time records submitted by the court appointees. Compensation for the guardian is addressed in MHL § 81.28, which provides that the court shall establish a plan for reasonable compensation of the guardian. While the statute suggests that the court may use Surrogate's Court Procedure Act (SCPA) § 2309 in setting compensation, that provision is merely a guideline and is not binding, particularly when the primary responsibilities of the guardian involve personal care. In some counties, the courts rely on a variety of methods when determining guardian compensation. Some judges determine a guardian's compensation based on a percentage of the amounts received and disbursed, or on a percentage of the principal, coupled with additional hourly compensation for any legal services rendered in connection with the appointee's official duties as a guardian (SCPA §§ 2307, 2309). In the alternative, some judges authorize compensation for guardians based entirely on an hourly rate. We examined all guardianship cases commenced in New York County Supreme Court between January 1, 1999 and December 31, 1999--a total of 338 cases. We reviewed 335 of these cases (three of the court files were not available). In about one-third of these cases the NYC Department of Social Services was the petitioner; in the remaining cases the petitioners were a health care facility, a hospital, or a friend or relative of the AIP. In addition to examining the court files, we reviewed information relating to these cases contained in the Office of Court Administration's fiduciary database, and we interviewed judges, court personnel and many of the fiduciary appointees in these cases. Compliance with the filing requirements was mixed. Although judges appointed a range of individuals as fiduciaries, a smaller, select group of individuals received the majority of the lucrative appointments. Judges rarely reduced the fee requests of the court appointees in cases in which the IP had assets. In the majority of cases, attorneys were paid hourly rates for legal services even when the services provided were not legal in nature. Of the 285 court evaluators required to file the Part 36 forms, 196 (69%) filed a notice of appointment, and 206 (72%) filed a certification of compliance. In total, 250 court evaluators awarded compensation by the court were required to file their statement of approval of compensation forms. In 146 (58%) of these cases, a statement of approval of compensation form was filed with OCA. In a number of the cases in which forms were not filed with OCA, a form was in the court file, although many were incomplete. In one case, the court evaluator was awarded compensation of $36,753, at an hourly rate of $400. An examination of the supporting affidavit made reference to over 80 telephone calls with no explanation provided as to the nature of these calls, each billed at $100. Further, the court evaluator billed almost five hours for preparing the fee application, and billed (at $400 an hour) for picking up a court transcript, calling the court clerk and preparing the OCA forms. The court awarded the entire fee requested, and also appointed the individual co-guardian for the IP at a rate of $400 per hour. In another case, a court evaluator who was an attorney was awarded compensation at an hourly rate of $250 for non-legal tasks such as faxing documents, telephoning directory assistance to obtain telephone numbers, renting a car, selecting clothing for and bringing food to the AIP. In another case, the court evaluator and associate each billed six hours for interviewing the AIP, medical personnel, and family members at a rate of $425 and $240 an hour, respectively. Further, the associate billed nearly two hours for arranging appointments and preparing the OCA forms. Although the court evaluator appointments were divided among 199 individuals, a much smaller group of individuals--23 (12%)--received over 50% of the total compensation awarded. Many of these individuals had connections either to each other or the political establishment. For example, two of the appointees were associates at the same small law firm, two were counsel to and one was an officer of a county political party committee, and one employed a county political party leader. As discussed, not every guardianship proceeding requires the appointment of a counsel for the AIP. The court appointed an attorney for the AIP in only 130 of the cases reviewed (in three of those cases a successor attorney was appointed). In over half of these cases, the court appointed Mental Hygiene Legal Service as the attorney. The other 64 appointments were divided among 47 attorneys. While most of the attorneys only received one appointment, a few were appointed in two or more of the cases. In total, only 56 of those appointed were required to file the Part 36 forms. Of these, 33 (59%) filed a notice of appointment and 32 (57%) filed a certification of compliance. In the 46 cases in which the attorney was awarded compensation, only 25 (54%) statements of approval of compensation were filed. While 35 attorneys were awarded compensation, a much smaller group of attorneys received most of the money. Six attorneys received more than 70% of the total fees awarded. Two of these attorneys, one a former judge and the other a high-level local bar association officer, were each awarded fees in excess of $50,000 in two cases. By comparison, none of the other 29 attorneys was awarded a fee over $6,000 in any one case. In 129 (46%) of the cases reviewed in which a guardian was appointed, the court selected as the guardian a friend or family member of the IP. In over 20% of those cases, the court appointed a private attorney to act as the co-guardian. Usually, a friend or family member was appointed as co- guardian to handle the IP's personal needs, and the attorney co-guardian managed the IP's property and financial matters. In 29% of the proceedings, a community guardianship program was appointed guardian. In a few cases, a successor guardian was appointed either to replace a community guardianship program when the IP was placed in a health care facility or when a guardian was discharged or resigned. In 53 (16%) of the proceedings, a guardian was not appointed. In some of those cases, the petition was withdrawn prior to the hearing, and in others the court determined after the hearing that a guardian was not necessary. Of the 111 guardians required to file the Part 36 forms, only 60 (54%) filed a notice of appointment, and only 65 (59%) filed a certification of compliance. In total, 41 guardians were awarded compensation. Of these cases, the court filed the approval of compensation form in 31 (76%) of the cases. As discussed, the courts use a variety of methods in determining a guardian's compensation. Generally, the fee arrangement is determined at the time of appointment. Some judges, however, delay choosing a method of compensation until completion of the guardianship or when payment of the guardian is warranted, such as after the review of the annual report by a court examiner. An examination of the cases revealed that the majority of judges calculated the guardian's compensation based on the statutory commissions while a few judges set a fixed hourly rate for the guardian. Other judges did not commit to a method of compensation, and noted in the appointing order that the guardian's commission was to be based on either SCPA § 2307 or SCPA § 2309, "whichever was higher." In cases where a family member or friend was appointed guardian, compensation was frequently waived. For 104 (29%) guardians compensation was based on a statutory commission. For 66 (19%) guardians, compensation was based on an hourly billing rate ranging from $10 to $450 per hour. For 59 (17%) guardians, no method of compensation was specified in the court file, and 49 (14%) appointees waived compensation. For 68 (19%) guardians, commission was determined pursuant to section 473-d(3)(d) of the Social Service Law. The remaining eight (2%) guardian's compensation was paid by the local social service agency. Some judges have expressed dissatisfaction with the compensation provided for guardians under SCPA §§ 2307 and 2309, particularly when the guardian's responsibilities include both personal and property management.7 In response, judges have awarded additional compensation to guardians when they had extensive responsibilities or appointed co-guardians. In setting the guardian's fee, courts have applied factors such as the type and nature of assistance provided to the IP, the amount of time the guardian expended in providing both personal needs assistance and property management and the allocation of time between the personal needs assistance and property management. In some cases, judges approved payment of legal fees in addition to statutory commissions to guardians who were attorneys, even for services that appeared to be responsibilities of a guardian as delineated in the statute. When setting hourly fees, the courts often did not differentiate between legal services rendered and guardianship services such as shopping for clothes and toiletries, paying bills and visiting the IP. In one matter, the IP's relative and an attorney were appointed co-guardians. The court set compensation amounts of $250 per hour for the attorney and $50 per hour for the relative. The IP resided in a health care facility and many of her personal needs were taken care of by the relative co-guardian. The attorney's role in the care of the IP, therefore, should have been limited. However, within a year, the attorney received over $65,000 in compensation, based on billing at the attorney's legal rate for tasks such as visiting an eyeglass store, attending a holiday party, exchanging clothing, inventorying the IP's wardrobe and sewing and ironing labels on the IP's clothing. Administrative duties such as drafting fee applications, calling financial institutions and returning apartment keys were also billed at the attorney's legal billing rate. Recently, a second judge assigned a special referee to examine the compensation awarded and the nature and type of guardian services provided in this case. In another matter, the court appointed as guardian of the property an individual who had never before served as a guardian and was not on OCA's fiduciary list at the time of appointment. The IP had limited assets and the case did not present complex legal issues. After about eighteen months, the guardian sought over $12,000 in compensation for services such as: 12 hours shopping for clothes, 12 hours handling banking matters, nearly 45 hours attending medical appointments with the IP, and attending the mandatory eight-hour guardianship training course. In addition, the guardian hired two attorneys to prepare and file the guardian's two affirmations of services, at a total cost of $1,275. Both MHLS and the court examiner opposed the guardian's fee requests, arguing that many of the services the guardian billed for could have been provided by the health care facility or were unnecessary. The court approved the guardian's full fees. If the guardian's compensation had been based on the statutory commission, it would have been less than $6,000. In another matter, a guardian who received compensation based on a fixed hourly rate billed over 100 hours for many tasks that appeared to be unnecessary. The guardian repeatedly spent over four hours traveling to a bank in another borough to deposit a $50 monthly social security check; each trip to the bank cost the IP $300. Additionally, the guardian billed at least seven hours for each court appearance. In total, the guardian received a fee over $8,700. If the guardian had received the statutory commission, the fee would have been less than $3,000. One attorney received 10 appointments and approximately $250,000 in compensation from a judge for whom the attorney regularly served as a special master.8 In an affirmation, the attorney listed as qualifications being "raised in a medical family" and having a "personal history of multiple surgical hospitalizations." The attorney also claimed to have been practicing elder law for 15 years, but later, when interviewed and asked to elaborate, admitted the reference was to personal experience with elderly relatives. Moreover, the attorney had declared bankruptcy twice. Two attorneys informed us that they received appointments from judges for whom they had provided free legal services. One of the attorneys represented a judge in a civil matter and had a social relationship that included lunches, dinners and visits to each other's home. Another attorney handled a real estate matter for the spouse of a judge from whom he had received fiduciary appointments; the attorney did not recall whether a fee was charged for handling the matter. One individual, who was both a law graduate and a registered nurse, received guardianship appointments from a judge with whom the nurse was a close friend. The nurse had been appointed to manage the assets of IPs, despite the fact that the nurse had declared personal bankruptcy. The judge also recommended to one fiduciary appointee that he hire the individual to provide nursing care for his ward. A tax accountant received appointments from a judge for whom the tax accountant had provided free accounting services over a multi-year period. The judge also suggested to other court appointees that they hire the accountant to provide financial services for their wards. The spouse of a law clerk has received numerous appointments, including three from the judge in the court part to whom the law clerk is assigned. Two attorneys, both counsel to a county political leader, received over 110 appointments in guardianship and receivership matters and were awarded compensation of approximately $400,000. One attorney, the spouse of a high-level managerial employee of the court system, received over 120 appointments in guardianship and receivership matters, resulting in over $360,000 in compensation. Two guardianship cases illustrate the problems discovered in many of the cases reviewed. In the first case, a guardianship proceeding was commenced by the hospital where the AIP, a retired college professor who had suffered a stroke, was a patient. The AIP was seriously ill and the hospital was seeking his discharge so he could spend his final days at home. The court appointed two guardians: an attorney who had regularly served as the judge's special master was appointed to handled the IP's personal needs, and a friend of the IP was appointed to handle the IP's property and financial matters. The IP's friend resigned shortly thereafter and was replaced as co-guardian by a tax and financial manager. A few months after the IP returned home from the hospital, he unexpectedly began to recover from his illness, and soon required much less assistance from the 24-hour home health aides. As he continued to recover, the IP attempted to take a more active role in his financial affairs, and he repeatedly complained about the harsh treatment he was receiving from one of the home health aides. Despite the IP's many requests and complaints, there was no change in his 24-hour health care, the hostile home health aide was not replaced and the guardians provided him with no information about his finances. The IP eventually retained his own attorney, and the attorney filed a motion to terminate the guardianship. In response, the court appointed a court evaluator to investigate and determine whether the IP still needed a guardianship. Following an extensive investigation and a trial period, the court evaluator concluded that the IP was capable of managing his own affairs. In her report, the court evaluator harshly criticized both guardians, and questioned whether the personal needs guardian had fulfilled his fiduciary obligations. Thereafter, the court discharged the home health aides and made arrangements for the IP to resume control of his finances. Although the guardians' day-to-day responsibilities now were no longer required, they continued to bill for another 70 hours, which included time spent researching the placement of the IP in an assisted living facility and the creation of a burial trust. Although he provided no legal services, the personal needs guardian was compensated at his legal billing rate of $215 per hour. The guardian of the property was compensated at a rate of $200 per hour. In all, the guardians spent over $481,000 of the IP's money, with nearly half paid to court appointees. The guardians received over $160,000 combined, nearly $100,000 more than they would have received had they been paid statutory commissions. The judge handling this case subsequently appointed the guardians again in another proceeding. In the second case, a guardianship petition was brought by a niece of the AIP who was concerned about the handling of the AIP's substantial assets by his newly retained attorney. At the time of the petition, the AIP was a wealthy retired doctor who was living at home with his wife of 50 years. The judge appointed a high-ranking local bar association official with whom the judge was friendly as counsel to the AIP, and a friend of the bar association official as court evaluator. Subsequently, the judge appointed the court evaluator as temporary guardian of the IP's property and financial matters and also as temporary personal needs co-guardian with the IP's wife. The temporary guardian then hired the original counsel for the IP (who was no longer needed in that capacity once a guardian was appointed) as his counsel and hired two other attorneys to advise him on other issues. At the same time, the court appointed another attorney, also a close friend of the bar association official, as court evaluator. After the guardians were in place, the court kept the court evaluator in the case to advise the court on financial issues.9 Later, without holding a hearing, the temporary guardians were made the permanent guardians. Over time, tension between the guardian and the IP's family developed. When the guardian questioned the capacity of the IP's wife to serve as co-guardian of the IP's personal needs, the judge temporarily suspended the wife as the co-guardian. The family eventually hired an attorney who, arguing that the animosity between the IP's wife and the guardian was having a detrimental effect on the IP and his family, requested that the court appoint the IP's niece as the sole guardian of the IP's personal needs. The judge declined to remove the guardian, but appointed the judge's personal physician to serve as personal needs co-guardian for the IP. After the family's attorney renewed the request for removal of the guardian, the judge appointed a new counsel for the IP to determine whether the IP wished to withdraw his original consent to appointment of guardian. The family also requested that all fees previously awarded to the guardian and his attorneys be disallowed.10 Shortly thereafter, the guardian resigned. The judge withdrew approval of some of the fees previously awarded and directed the guardian and his attorneys to return a portion of the fees pending further review by the court. The judge then appointed the IP's wife and niece as co-guardians of the IP's property and person and directed the prior guardian to file a final accounting of the proceeding. The judge also withdrew from the case. The new judge then released the court evaluator and the counsel to the IP, and ordered a hearing to determine whether the guardianship was necessary. By the conclusion of the guardian's tenure over $750,000 in fees had been requested by the guardian, his attorneys, accountants and investigative and investment services. The guardian and the second court evaluator each billed at a rate of $300 per hour. The guardian's three attorneys billed at rates ranging from $325 to $400 per hour, often for the same services. For example, the guardian's billing records reveal that a great deal of his time was spent updating each attorney on the work the other attorneys were doing. Additionally, there were numerous meetings and conference calls involving all of the attorneys and the guardian, with each billing for the time spent. In all, the guardian has requested over $277,000 in compensation for services he provided as guardian and as the first court evaluator. The second court evaluator has received almost $60,000 in compensation. The guardian's three attorneys have requested nearly $290,000 in compensation.11 Approximately $200,000 was requested for accountants, investment consultants and investigative services. In Queens County, we reviewed a random sample of 25 cases in which guardians were appointed. The court appointed Mental Hygiene Legal Service as court evaluator in one case and a family member as guardian or co-guardian in 10 cases. Compliance with the filing requirements was mixed. Although 21 of 24 court evaluators (88%) filed a certification of compliance and 23 of 24 (96%) filed a notice of appointment, only eight of 14 guardians (57%) filed a certification of compliance and nine of 14 (64%) filed a notice of appointment. In addition, only 12 approval of compensation forms were filed for the 23 fiduciaries for which they were required (52%). preparing the final accounting and order. One shopping trip cost the IP over $1,000 in fees--$750 for the partner and $387 for the associate. The guardian and an employee billed $850 to celebrate the IP's birthday when they bought her flowers and a birthday cake and visited with her at the nursing home. Another visit to the nursing home by the guardian's employee included "shopping for Thanksgiving pies and ice cream," for which the IP was billed $375 in fees. On another occasion, when the guardian and the guardian's employee visited the IP at the nursing home, they took her out for a walk and bought her an ice cream cone. The guardian billed $1,275 for this visit. One attorney received five appointments in a 12- month period in which the compensation ultimately received was $31,894, $18,600, $8,000, $11,902 and $15,405, respectively. That attorney received nine separate appointments in a period of just over two years for which the compensation exceeded $5,000. In all, the attorney appears to have violated the $5,000 rule eight times in that time span. All of the attorney's appointments were made by the same judge, and none of the files indicate that the attorney received the appointment pursuant to an exception to the $5,000 rule. Another attorney received four appointments in a three-month period where the ultimate compensation exceeded $5,000, including two appointments where the compensation was $37,174 and $24,230. A review of the OCA fiduciary database for the period 1995 through 1999 reveals that about a dozen attorneys received many lucrative appointments in Queens County. Some of these attorneys also received lucrative appointments from judges in other jurisdictions, including New York, Kings, Nassau and Suffolk counties. One of the attorneys received approximately 130 appointments totaling over $525,000. Another attorney received 46 appointments in Queens County, of varying amounts, totaling over $130,000. One attorney received 73 smaller cases totaling over $100,000 and another received 46 fiduciary appointments resulting in over $130,000 in fees. A former judge received over 110 fiduciary appointments in a variety of jurisdictions, including Queens, with compensation over $400,000. In Kings County, we reviewed a random sample of 50 guardianship cases. The court appointed a family member as the guardian or co-guardian in 30 of the cases and a non- profit organization as guardian in six of the cases reviewed. The court appointed a total of 24 guardians or co-guardians who were not relatives of the IP or a non-profit organization. Court evaluators filed a notice of appointment form in 38 (76%) of the cases, and a certification of compliance in 42 (84%) of the cases. Only six (25%) of the 24 guardians filed a notice of appointment, and only 10 (42%) filed a certification of compliance. Approval of compensation forms were filed for court evaluators in 32 (76%) of the 42 cases where they were required and in 9 (53%) of the 17 cases where they were required for guardians. The guardian was paid $9,000 in legal fees (at an hourly rate of $250), in addition to over $6,000 in guardian commissions. The items identified as legal work in the guardian's affidavit of services included such routine tasks as a review of the IP's assets, preparation of an initial and annual accounting, and conversations with personnel at the IP's nursing home. Despite the award to a guardian of $9,000 in legal fees, the guardian performed no legal work. The sole legal matter that arose was a lawsuit that had been filed against the IP, for which the guardian hired an attorney. The approval of compensation form stated that the guardian was awarded $2,785 in compensation, but our review of the court file revealed that the guardian received over $15,000 in fees. During an interview, the guardian claimed that all records pertaining to the case had been misplaced. Although an attorney himself, the guardian hired another attorney for assistance, at a rate of $250 per hour. The OCA fiduciary database reveals that the other attorney has received over 120 fiduciary appointments and over $350,000 in fees. In this case, the attorney was awarded $1,400 in fees for assisting the guardian in preparing his annual accounting, which is part of the guardian's routine duties. When the guardian withdrew from the case nine days prior to the IP's death, his attorney was appointed as successor guardian. Although guardian for only nine days, the successor guardian was awarded $10,000 in commissions and $5,000 in legal fees. We concluded that at least two guardians received appointments in apparent violation of the $5,000 rule. One attorney received three guardianship appointments within a 12-month period that ultimately paid $31,006, $21,286 and $15,000, respectively. Another received two appointments where the compensation was $10,000 and $7,500, respectively. The court files in these cases contained no documentation that the appointing judges waived the rule based on the narrow exception. 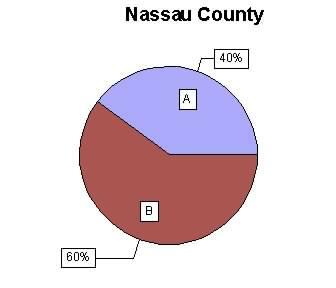 In Nassau County, we reviewed a random sample of 25 cases in which guardians were appointed. Mental Hygiene Legal Service was appointed as court evaluator in three cases and a family member was appointed as guardian or co- guardian in six cases. 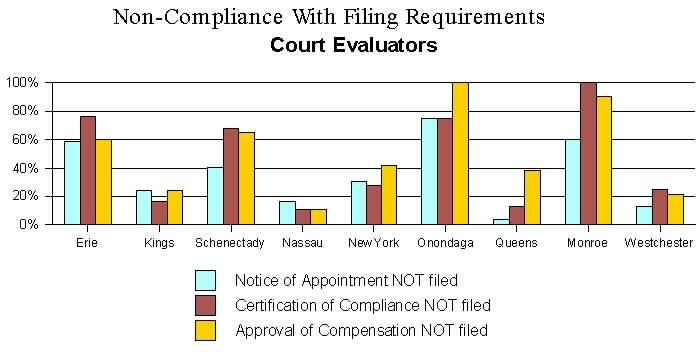 Of the 19 court evaluators required to file forms, 17 (89%) filed a certification of compliance and 16 (84%) filed a notice of appointment. Seven of the 11 guardians (64%) required to file forms filed a certification of compliance and six (55%) filed a notice of appointment. Approval of compensation forms were filed on behalf of 17 of the 19 court evaluators (89%) and two of the five guardians (40%) for whom filing was necessary. In two matters it appears that the guardians, who were attorneys, were awarded separate fees for guardianship services and legal services. The "legal services," however, included preparing and filing the final accounting, which is part of the guardian's responsibilities. In another matter, the guardian, who was an attorney, hired another attorney to perform legal work. The guardian's attorney's affirmation included time spent meeting with the guardian to discuss procedures, preparation and review of the guardian's affirmation of services and preparation and review of the final report and account. Thus, the attorney was compensated for services for which the guardian was also compensated by the payment of commissions. One IP had been deceased for over three years before the guardian submitted his final accounting. It also appears that several appointees in Nassau County may have violated the $5,000 rule. In these cases, there was no documentation in the court files suggesting that the court found that these appointees met the narrow exception to the rule. In Erie County, we reviewed a random sample of 50 cases in which guardians were appointed. Mental Hygiene Legal Service was appointed attorney for the AIP in one case, court evaluator in five cases and guardian in one case, a nonprofit organization was appointed as guardian in eight cases and a family member was appointed guardian or co-guardian in 28 cases. Three of the 12 counsel for the AIP (25%) filed a certification of compliance and five (42%) filed a notice of appointment; 11 of 46 court evaluators (24%) filed a certification of compliance and 19 (41%) filed a notice of appointment; and four of 19 guardians (21%) filed a certification of compliance and two (11%) filed a notice of appointment. Where approval of compensation forms were required to be filed, three of 7 were filed for counsel for the AIP (43%), 14 of 46 for court evaluators (30%) and three of 14 for guardians (21%). Some of the appointees were awarded compensation even though they failed to submit an affidavit. One judge approved a fee based on illegible handwritten time sheets. In one case the guardian recommended that the court evaluator receive a fee that was higher than the requested fee, on the ground that the guardian had seen how hard the court evaluator had worked. The court awarded the higher fee based on the guardian's oral recommendation. In another matter, the court evaluator was appointed as guardian, and was awarded both a commission and an hourly fee. The legal fees, however, included billing for routine guardianship responsibilities that are covered by the statutory commission, such as visiting the IP, corresponding with the court examiner and preparing the annual accounting. In Westchester County, we reviewed a random sample of 25 cases. The court appointed Mental Hygiene Legal Service as court evaluator in two cases. Family members were appointed as guardians or co-guardians in 11 of the 25 cases. Of the 16 court evaluators appointed, 12 (75%) filed a certification of compliance and 14 (88%) filed a notice of appointment. But of the eight guardians required to file, only two (25%) filed a certification of compliance and only one (13%) filed a notice of appointment. An approval of compensation form was filed on behalf of 11 court evaluators (79%), but none were filed on behalf of six guardians. In some of the cases we reviewed, appointees received compensation in excess of the statutory fee originally authorized by the court. In one matter, the appointing order specified that the guardian was to be compensated pursuant to SCPA § 2309. Thereafter, the successor guardian received guardianship commissions and legal fees for filing the final accounting. Despite the original court order, the guardian was compensated based on a calculation using SCPA § 2307, rather than SCPA § 2309, resulting in an increase in fees of over $1,000. The guardian also received legal fees for preparation of the final accounting, a task that a guardian should be expected to perform as part of the guardianship commission. In Monroe County, we reviewed a random sample of 25 cases. Mental Hygiene Legal Service was appointed court evaluator in two cases, a nonprofit agency was appointed guardian in 10 cases and family members were appointed guardian or co-guardian in 12 cases. Compliance with the filing requirements was poor. None of the appointees filed the certification of compliance form. Only one of five (20%) counsel for the AIP filed a notice of appointment, while only eight of 20 (40%) court evaluators filed and none of the four guardians filed. Fees were awarded to 20 court evaluators but only two approval of compensation forms (10%) were filed, and five counsel for the AIP were compensated but no forms were filed. No guardians received compensation. It appears from the OCA database that one attorney received appointments that violated the $5,000 rule. The attorney was initially appointed as the court evaluator in one case and awarded over $5,000 and then appointed guardian in that same case for which the attorney earned $17,000; subsequently, the attorney was appointed guardian in another case for which the attorney eventually earned over $13,000. We also reviewed a random sample of 25 cases in Schenectady County. Mental Hygiene Legal Service was appointed counsel to the AIP or court evaluator in five cases, and 14 family members were appointed guardian or co- guardian. Of those required to file the forms, one (25%) counsel for an AIP filed a certification of compliance and two (50%) filed a notice of appointment; seven of the 22 (32%) court evaluators filed a certification of compliance and 13 (59%) filed a notice of appointment; and two (20%) of the ten guardians filed a certification of compliance and two (20%) filed a notice of appointment. Of those appointees for whom an approval of compensation form was required, none were filed for the counsel for the AIP, seven (35%) were filed for the court evaluators and two (22%) were filed for the nine guardians. Under New York law, when there is a risk that a business or property that is the subject of a civil action in a superior court may be "removed from the state, or lost, materially injured or destroyed," a person with interest in the business or property may move for appointment of a receiver to manage the business or property while the action is pending (CPLR § 6401(a)). Generally, the receiver is authorized to take and hold real and personal property and sue for, collect and sell debts or claims (CPLR § 6401(b)). In the most common proceeding in which a receiver is appointed--a mortgage foreclosure proceeding--this means that the receiver is authorized to collect rents and institute or defend lawsuits related to the collection of rent or the eviction of tenants. In general, a receiver's fee, which is paid from the proceeds of the property or business that is the subject of the receivership, may not exceed five percent of the total sums the receiver collects and disburses (CPLR § 8004(a)). In cases in which the receiver's commission, based on the five percent formula, would not amount to $100, the court may authorize a fee of up to $100 for the services rendered. In addition, in cases in which the receiver collects no sums, or is in possession of no sums at the termination of the receivership, the court may authorize a fee based on the services rendered (CPLR § 8004(b)). A receiver "shall have no power to employ counsel unless expressly so authorized by order of the court" (CPLR § 6401(b)). As noted, Part 36 provides that "persons designated to perform services for a receiver" shall be appointed by the court (22 NYCRR § 36.1(a)). If a counsel is appointed, the fees for such appointees must be reasonable. A receiver may also be reimbursed for expenses necessarily incurred in the performance of his or her duties, such as clerical, auditing, legal or other services. If the receiver is an attorney, however, routine legal services should be performed without separate compensation.12 Additionally, if the receiver hires an individual to do work that should properly be performed by the receiver, the receiver's commission should be reduced accordingly.13 A receiver must provide a full accounting and document in sufficient detail the services provided (see generally CPLR § 6404). An illustration of the dynamics of fiduciary appointments in receivership proceedings in Kings County is the case of People of the State of New York v. Cypress Hills Cemetery (Index. No. 38143/93). The Cypress Hills case is not a mortgage foreclosure proceeding, and it is far more complex and protracted than the typical Brooklyn receivership proceeding. Yet the relationships of the fiduciary appointees in this case to the Brooklyn political establishment and to each other are emblematic of the process in many of the more routine receivership cases in Brooklyn. In 1993, the State Attorney General's Office initiated an action in Brooklyn Supreme Court requesting that Cypress Hills Cemetery be placed in receivership because of mismanagement. It was also revealed that the Cemetery Board had permitted over 1,000 bodies to be buried in a "hill" of construction debris that had been created for cemetery plots. Since its inception, the matter has been handled by Supreme Court Justice Richard D. Huttner. Justice Huttner appointed the first receiver for the cemetery in 1993. The receiver then hired the Brooklyn law firm of Garry & Ludwig as counsel to the receiver. The firm was composed of two partners, William J. Garry and Arnold J. Ludwig, and associate Thomas J. Garry, William Garry's younger brother. Arnold Ludwig, a former law secretary to two Brooklyn Supreme Court Justices, is an officer in the Brooklyn Democratic organization and was a member of the County party's law committee. 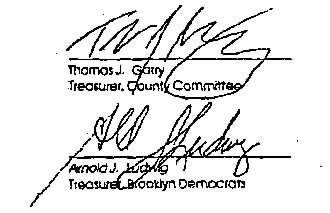 Thomas Garry is also an officer of the Brooklyn Democratic organization and was a member of the party's law committee. William Garry and Thomas Garry, who joined the firm in 1995, are the sons of a Brooklyn Supreme Court Justice. The receiver also hired a property manager to manage the cemetery. Although the first receiver was replaced in 1996, Garry & Ludwig were continued as counsel. Then, in 1998, Justice Huttner replaced the second receiver with Manhattan attorney Ravi Batra. Beginning in 1995, Mr. Batra has employed the Brooklyn Democratic County Leader in an "Of Counsel" capacity. Since then, the number of Mr. Batra's fiduciary appointments has substantially increased. Following his appointment as receiver, Mr. Batra continued to employ the services of Garry & Ludwig and the property manager. On December 6, 1999, however, he wrote to Garry & Ludwig advising that he was replacing them as counsel to the receiver with his own law firm, not only in the Cypress Hills case but also in three other pending cases in which Mr. Batra was serving as the receiver. Conflicting reasons have been offered for the replacement of Garry & Ludwig as counsel. Mr. Batra claims that the firm was incompetent and was attempting to "churn" legal fees. Garry & Ludwig claim that Mr. Batra was motivated by greed. Cypress Hills was a lucrative appointment for all concerned. Since the inception of the case, well over $1.5 million has been awarded to the various receivers, counsel and property manager. From April 1994 through May 1998, the two initial receivers were awarded $128,000 in commissions. Mr. Batra initially sought $117,000 in compensation for the period of June 1998 through November 1998, but his commission was reduced to $31,400. As counsel to the receivers, Garry & Ludwig received approximately $250,000 in fees. Based on a series of one-year contracts approved by the Cemetery Board providing for monthly management fees ranging from $14,500 to $17,100, the property manager has received over $1.2 million in fees for its management of the cemetery. It has become apparent that our diligent work and unquestioned loyalty to the Organization over the many years are clearly not as important as the desires of Mr. Ravi Batra. Although Mr. Batra holds no party or elected position in our County, he has nevertheless imposed himself on the political workings of our Organization for the sole purpose of his own personal financial gain. * * * * [W]e will be unable to continue to represent candidates for elected and/or judicial office free of charge as we have done so in the past . . . . while the Organization sits idly by and permits Mr. Batra to maliciously injure our practice and reputation without consequence * * * * To continue on in our capacity as Law Committee members in light of Mr. Batra's inexcusable actions would be far too much to expect, given the fact that the Organization has permitted an individual with no party position or history in this County to dictate how our Organization is run. . . . Mr. Batra has never assisted the Law Committee on any level whether it be collecting signatures, binding petitions or trying an election law case, etc. In fact, it is unknown as to what Mr. Batra has accomplished in any capacity to benefit our Organization. It is unfathomable that such action would be tolerated by any other political organization within this City or State. It is quite evident that permitting Mr. Batra's behavior has severely damaged our credibility and reputation as a political Organization. * * * * We hope that one day in the not so distant future we will be able to work together again when the interests of the Organization are once again paramount to the unfettered demands of one non-contributing individual. Garry and Ludwig sent copies of the letter to dozens of other party officials. Weeks later, the press obtained the letter, which was also attached as an exhibit to papers filed in the Cypress Hills litigation. Months later, Mr. Batra resigned his appointment as receiver in the case, and he was replaced by the property manager. In September 2000, the cemetery filed a petition in federal Bankruptcy Court seeking reorganization under Chapter 11. Our investigation in Brooklyn Supreme Court concentrated on all mortgage foreclosure cases in which a receiver was appointed between January 1, 1995 and October 31, 2001. Although receivers are occasionally appointed in other types of Supreme Court cases, these appointments overwhelmingly arise in mortgage foreclosures. The investigation identified 468 mortgage foreclosure cases in which a receiver was appointed between January 1, 1995 and December 31, 1999. We reviewed the court files in only 417 of these cases, because the Clerk's Office was unable to locate the remaining 51 files. Of the files we reviewed, many were incomplete, with required forms and information about appointments and compensation either missing or inadequate.15 Additionally, we reviewed OCA's fiduciary appointment database to determine whether the filings required under Part 36 were made in these cases. We also conducted a wide range of interviews with judges, fiduciary appointees, other attorneys involved in these cases and court personnel. In general, there was extremely poor compliance with the filing requirements of Part 36. In general, receivers were authorized to decide themselves whether to retain counsel or a property manager; contrary to the requirements of Part 36, the receivers, not the judges, appointed their counsel and property managers. In the vast majority of the cases in which receivers retained counsel, they retained the law firm of Garry & Ludwig, in violation of the requirements of Part 36. In the vast majority of the cases in which receivers retained property managers, one of two companies was retained. Little documentation was provided to the court substantiating fees charged by receivers and their secondary appointees. In the 417 cases reviewed, 439 receivers were appointed (successor receivers were appointed in some cases). Of these 439 receivers, only 125 (28%) filed a notice of appointment, while 89 (20%) filed a certificate of compliance. Although, as discussed, the fiduciary rules provide that a judge shall not authorize payment to a fiduciary appointee unless the fiduciary has filed a notice of appointment and a certificate of compliance, our investigation identified no cases in which a judge refused to authorize compensation to a receiver on the ground that filings had not been made. In addition, we found no approval of compensation statements filed in any of the cases we reviewed. We identified 418 "secondary" appointments in the 417 cases we reviewed. Of these, 253 were appointments of counsel and 165 were appointments of property managers. None of these appointees filed a notice of appointment or a certificate of compliance. Moreover, no statements of approval of compensation were filed for any of these appointees. In contrast to these findings of widespread lack of compliance with the filing requirements, the investigation did not reveal widespread violations of the $5,000 rule. Only one individual apparently obtained receivership appointments in violation of this rule. In addition, by virtue of its numerous appointments as counsel to a receiver, the law firm of Garry & Ludwig obtained appointments in violation of this rule. Two management companies, by virtue of their receipt of most of the property manager appointments in these cases, also apparently obtained appointments in violation of the rule. This is more fully discussed below. One individual, who at the time was an official of the Brooklyn Democratic organization, received 46 appointments as receiver, or roughly 10% of all appointments during the period examined. During this period, this person received $137,242 in fees, or 34% of the total fees awarded to receivers in mortgage foreclosure cases. In early 1999, the individual described above who received the 46 appointments resigned his appointments. He recommended an attorney with close ties to a top party official as his replacement in those cases that were still outstanding. The individual asserted in motion papers that the attorney was already familiar with the cases and willing to accept the assignments. During our interviews we learned that, in fact, the attorney was not familiar with the specifics of these cases. Judges appointed the attorney as successor receiver in four of these cases. This attorney received a total of 15 appointments. The two-member law firm of a high-ranking official of the Brooklyn Democratic organization received 34 receivership appointments. One judge made 31 receivership appointments during the period examined, more than twice as many as the judge making the second most appointments. Of the 31 appointments, 21 went to one individual. That appointee contended in motion papers that he needed to hire counsel in those cases because he had no experience in mortgage foreclosures and receiverships. Overall, a group of 16 individuals (which includes the two-partner law firm noted above) received over half of the receivership appointments during the period examined. Additionally, an even smaller number of appointees--six-- received over half of the receivership fees. The appointee with the largest number of appointments received the greatest total amount of compensation--$137,242. The remaining 65 other individual appointees received a total amount of $173,557. In the 417 cases in which receivers were appointed in Kings County during the 1995-99 period, 253 counsel appointments and 165 property manager appointments were made. As discussed, despite the requirements of Part 36, a practice had evolved in the courts in which the receivers selected their own counsel and property managers. In fact, in all of the cases we reviewed in which counsel or property managers were appointed, the appointments were made by the receiver. The qualifications of those appointed were never reviewed by the court. The only cases in which the court reviewed a receiver's decision to appoint counsel or a management agent were those in which a motion opposing the appointment was filed. A primary consequence of this practice was that the law firm of Garry & Ludwig, which actually was ineligible for this work because of the prohibition against relatives of judges receiving fiduciary appointments, was appointed as counsel to the receiver in at least 189 cases, or 74% of the cases in which a receiver retained counsel.17 The firm received $464,554 from these assignments (in addition to the $250,000 it received from the Cypress Hills assignment). By comparison, the other counsel to the receiver appointees received a combined total amount of $130,472. Two management companies received 63 and 66 appointments respectively, or 76% of the property manager appointments during the period examined. In addition, these two companies received 84% of the fees awarded to property managers (not including the additional money that one received from its Cypress Hills assignment). In their orders appointing receivers, judges addressed the issue of the receiver's authority to retain counsel in a variety of ways. Some judges permitted the receiver to retain counsel for any matter or purpose. Others specified that the receiver was limited to retaining landlord/tenant counsel if it became necessary to bring an eviction or collection of rent proceeding, but was not permitted to retain counsel for any other purpose. Yet other judges, not intending to limit the receiver's authority at all, crossed out provisions in the order that would have restricted the receiver to retaining counsel only for landlord/tenant matters. In many cases in which the appointing order did not authorize the receiver to retain counsel or a property manager, the receiver would hire counsel or a property manager anyway. Subsequently, when the time came for payment in these cases, the counsel would prepare a motion to have himself or herself and the property manager appointed nunc pro tunc (that is, after the time when it should have been done, with a retroactive effect). In some cases opposition papers were filed, with opposing counsel arguing that the receiver had retained counsel and a property manager without court approval and thus they were not entitled to compensation. These arguments, however, were never successful--in all of the cases we reviewed, the court always authorized payment to such appointees retained without initial court approval. Regardless of the language in the appointing orders, receivers in Brooklyn routinely retained counsel. This was true even if the receiver was an attorney and had prior experience as a receiver. An attorney who was a recognized expert in receivership law regularly hired counsel whenever he was appointed as receiver. In fact, in several of the cases reviewed, that attorney and another attorney switched roles--when one was appointed receiver he would retain the other attorney as counsel. The apparent explanation for the great incidence of receivers hiring counsel is a financial one. Our investigation revealed that the nature of the work performed by counsel to the receiver appears to be routine, typically involving review of documents, preparation of accountings and meeting with tenants and property managers.18 Receivers, however, are compensated at the statutory rate of five percent of receipts and disbursements, whereas counsel for the receiver are compensated at their hourly rate for legal services. Thus, in the average Brooklyn foreclosure receivership case, in which the receipts and disbursements tend to be relatively small, compensation for the counsel is usually more lucrative than for the receiver. Even in cases in which little rent is collected, the counsel to the receiver could still earn over five times the amount earned by the receiver by billing for work that was the receiver's responsibility. 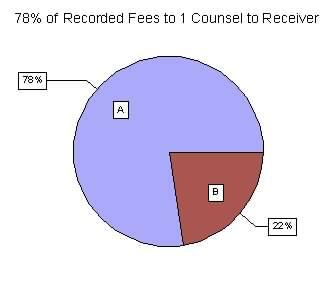 Indeed, in 85% of the cases in which counsel was retained, the counsel's fees exceeded those of the receiver. In 25 of the cases, counsel earned at least twice as much as the receiver, and in one case the counsel actually earned 75 times as much as the receiver. Property managers also typically earned more than the receivers. In 85% of the cases in which property managers were retained, their fees were higher than the receivers' fees. In 17 cases, the property manager earned at least twice as much as the receiver, and in one case the property manager earned 40 times as much as the receiver. In 11 cases, the order appointing a receiver directed the receiver to apply to the court for approval before retaining counsel. In three cases, the order appointing a receiver specified the name of the counsel the receiver should retain. In 11 cases, the order appointing a receiver did not instruct the receiver to apply to the court for approval before retaining counsel. In seven cases, the order appointing a receiver directed the receiver to apply to the court for approval before retaining a property manager. In seven cases, the order appointing a receiver specified the name of the property manager the receiver should retain. In ten cases, the order appointing a receiver did not place any restrictions on the receiver retaining a property manager. As discussed, the CPLR expressly limits a receiver's fee to a maximum of five percent of the amounts received and disbursed (CPLR § 8004(a)). In cases in which this limitation would result in a fee of less than $100, the court may approve a fee of up to $100 for the services rendered (Id.). In many of the Kings County cases we reviewed, judges awarded receivers compensation in excess of these statutory limits. Additionally, in other cases judges reduced the receiver's fee but awarded the counsel to the receiver and the property manager their full fee requests, which were always considerably higher than the receiver's fee. And in some cases in which the receiver collected no rent at all, fees were awarded to the receiver, the counsel to the receiver and the property manager. In one case, the receiver requested and was awarded ten percent--double the statutory amount--as well as attorney fees for preparation of the attorney's own bill. In another case, the receivership was terminated without any rent collected. The court awarded the receiver the entire $725 requested. A portion of the receiver's bill included time spent determining whether or not to accept the appointment, reading the statutes governing receiverships (owing to unfamiliarity with the law) and conversing with a political party official about the identity of the defendant's attorney. In a case in which very little rent was collected, the court clerk advised the judge that the receiver was entitled under the statute to a fee of only $79.55, not the $500 requested. The judge awarded the receiver $500. In a case in which the receivership lasted only 20 days, the receiver failed to collect any rent. The court awarded the receiver $500, the property manager $500 and the counsel to the receiver $5,817. In a case in which the receivership lasted only nine days, it was requested that the receiver take no action because the parties were attempting to settle the matter. Although no rent was collected, the receiver sought $500 for himself, over $2,000 for general counsel, $400 for landlord/tenant counsel and $800 for the property manager. In an effort to settle the case, the petitioner agreed to pay the requested amounts. In many cases, counsel to the receiver submitted bills to the court in which their work was not itemized. Frequently, counsel merely informed the court of their hourly rate and then stated the amount of time they had spent on the case. In some cases, the bills simply reflected "court appearance" with a multi-hour charge and no further indication of what had occurred. In some of the final accountings, counsel failed to detail expenditures, stating simply that the receipts and bills were available for review; in others, receivers offered to produce receipts and other documentation but only if an objection was filed. In the cases examined, rarely did the court request specification. Even in cases in which opposing counsel objected to the amount of the fees sought and requested further specification, the court did not require further specification and simply awarded the fees requested. Although opposing counsel occasionally did object to the fees requested, we learned that they generally did not challenge questionable fee requests because they believed it would be futile to do so as well as prohibitively expensive. In many cases, a significant portion of the counsel's bill was for preparation of bills for the receiver and counsel. When required to explain these bills, additional billing resulted. In one case, an objection to the final accounting was filed because the receiver had failed to specify the disbursements and explain why the amount of rent collected had varied from month to month. The receiver, counsel to the receiver and the property manager were all awarded the entire amounts they had originally sought. The counsel was also paid an additional $2,000 for litigating the receiver's final accounting. In another case, an opposition to the receiver's final accounting was filed in which billing for boiler repair was questioned because the building did not have a boiler. The parties ultimately settled the matter. In another case, the receiver's first accounting erroneously requested an amount in excess of the statutory limit. Thereafter, the counsel to the receiver (who was the receiver's brother) prepared a second bill, and was awarded $750 for the preparation of each bill. In a case in which the receivership lasted for approximately seven months, no rent was collected and the only money received was $1,100 from the mortgagor. The receiver requested a fee of $500, along with $6,266 for his outstanding bills which included $3,200 for counsel and $2,100 for the property manager. The petitioner opposed the payments, arguing that a property manager was not needed because the building was a vacant single family home, the property manager had never even visited the premises and the receiver had no authorization to retain counsel. The court approved the final accounting, and awarded the receiver his full fee but cut the payment for the outstanding bills to $3,500, although it did so without specifying how the receiver should distribute the money. Moreover, in many of the cases reviewed, the receiver and the secondary appointee had a business relationship or were actually the same person. For example, in a number of cases the owner or an employee of a property management company was appointed as receiver and then hired his or her company as the property manager. In other cases, paralegals were appointed receiver and then hired their employers as counsel to the receiver. And in a few cases, the receivers hired themselves or their own law firms as counsel and then were awarded receivership fees and counsel fees. Contrary to what transpired in most of the cases, routine mortgage foreclosure proceedings in which a receiver is appointed do not necessarily require the appointment of a counsel and a property manager. Some receivers performed the necessary work themselves and did not hire counsel or property managers. Receivers in these cases told us they realized that funds might not be plentiful and so they took steps to minimize expenditures. Additionally, in some cases, efforts were made to contain expenses by charging lower hourly rates and by not charging for preparing the receiver's final accounting. Our review of receivership cases in other counties uncovered many of the same problems we identified in Kings County. Compliance with the filing requirements was poor, many courts authorized payment to appointees without ensuring that the Part 36 forms were filed, very few courts made the secondary appointments and compensation was often excessive, unsubstantiated or in violation of statutory requirements. In Nassau County, where we reviewed a random sample of 25 receivership cases, there was little compliance with the filing requirements. Only four out of 26 receivers (15%) filed a certification of compliance and only six (23%) filed a notice of appointment. Filing of the approval of compensation forms was also poor, with only 15% of the forms filed for the receivers and no forms filed for secondary appointees. Moreover, the court failed to make any of the appointments of counsel or property managers. In fact, many of the orders appointing receivers expressly authorized the receiver to retain a counsel and property manager. Additionally, in two cases the receivers were awarded fees that were higher than the five percent statutory commission rate. In one case, the receiver was awarded double his permissible compensation. 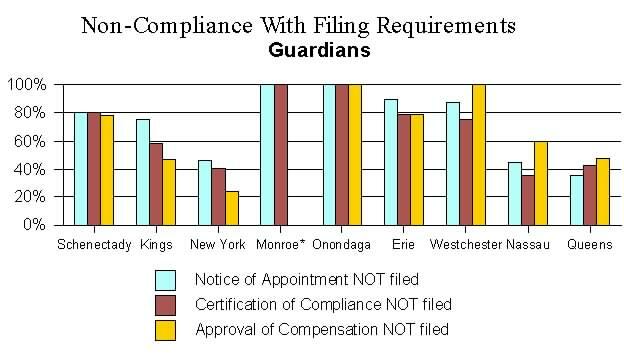 In Erie County we reviewed a sample of 24 cases in which 26 receivers were appointed.19 Compliance with filing requirements was inadequate, with only five (19%) of the receivers filing a certification of compliance form and six (23%) filing the notice of appointment forms. Only three of the ten (30%) required approval of compensation forms were filed. None of the property managers, many of whom were not appointed by the court, filed either a certification of compliance or a notice of appointment. In one case, the receiver miscalculated the commission and received nearly double the permissible compensation. In another case, the receiver was compensated on an hourly basis, resulting in a payment almost three times higher than it would have been had the receiver been compensated in accordance with the statute. The receiver's bills included five hours per month for apparently routine receivership duties such as site inspections, rental of units and conferring with contractors and vendors about repairs. In Westchester County, we reviewed a sample of 29 cases in which receivers were appointed. All of the cases were selected randomly from the OCA fiduciary database, because the court maintains no method by which foreclosure cases in which receivers are appointed can be identified. Thus, because cases are entered in the OCA database only when at least one fiduciary form for a case has been filed with OCA, we had no way of precisely measuring the rate at which fiduciary appointees and judges in Westchester receivership cases comply with the filing requirements. We did determine, however, that only 15 (52%) of the receivers filed a certification of compliance (which is filed only in the court file and not with OCA), and that no secondary appointees filed any of the forms. In addition, of the 24 fiduciaries who received compensation--23 receivers and one counsel to a receiver--only three (13%) approval of compensation forms were filed. In four of these cases, the court cited a stipulation between the petitioner and the receiver as justification for the fee. Judges in the other four cases provided no explanation for approving compensation exceeding the statutory limit. In most of the cases, the fees were at least 50% higher than the statutory rate. In a few cases, the fee was nearly 200% higher than the statutory rate. Moreover, in some cases, in addition to collecting their commission, fiduciaries were awarded hourly fees for routine services they were required to perform. In one matter, a receiver hired his own law firm as his counsel. He also hired an accountant and a property manager. The counsel's affidavit of services included many items that appear to be routine responsibilities of a receiver, including calculating the receiver's commission and preparing the final accounting. The receiver, his law firm, the accountant and the property manager each earned approximately $20,000. The court file, however, contained no documentation supporting the fees for the accountant and property manager. In Schenectady County, we reviewed a sample of 17 cases in which receivers were appointed. Because the court was only able to provide a list of ten cases in which receivers were appointed during the five-year period under examination, the additional seven cases were selected randomly from the OCA fiduciary database. Again, because cases are entered in the OCA database only if at least one of the required forms has been filed, an accurate analysis of compliance with the filing requirements is not possible. In the 17 cases reviewed, there were 18 receivers appointed including a successor receiver. Of these, ten receivers (56%) filed a notice of appointment and only two (11%) filed a certification of compliance. In addition, of the 13 receivers and one property manager who received fees necessitating the filing of an approval of compensation form, only two such forms (14%) were filed. In one matter involving a large commercial property, the court appointed the property manager but authorized the receiver to employ such legal counsel as he deemed necessary. The receiver was awarded almost $100,000, or approximately three percent of the receipts, and the property manager was awarded five percent of the receipts. The case file, however, did not contain documentation supporting all of the fees awarded. In another matter, the receiver hired an accountant without approval from the court and paid the accountant for his services. When the plaintiff objected, the court awarded the receiver a commission but deducted the amount paid to the accountant. We reviewed a random sample of 25 receivership cases in Queens County. Only two (7%) of the 28 receivers appointed in these cases filed a certification of compliance form and only five (18%) filed a notice of appointment. No approval of compensation forms were filed for the 12 receivers who received compensation requiring the filing of such forms. In the cases reviewed, eight secondary appointments were made--four counsel and four property managers. The court did not make these appointments, and none of the required forms were filed. A review of the appointment orders disclosed that the receivers were given broad authority to appoint counsel and property managers as deemed necessary, without any court intervention. In addition, in some of the cases the receivers were paid excessive fees. In one matter, the receiver was paid both the statutory commission and separate legal fees for routine services required of a receiver, such as filing the bond and preparing the accounting. A court appoints a guardian ad litem to protect the rights of an individual under a disability who is involved in litigation. The Surrogate's Court Procedure Act (SCPA) defines a person under a disability as: (1) an infant under 18 years of age; (2) a person judicially declared incompetent to manage his or her affairs; (3) an incapacitated person; (4) an unknown person or one whose whereabouts are unknown; or (5) a person confined as a prisoner who failed to appear under circumstances that the court finds are due to confinement in a penal institution (SCPA §§ 103, 402). A guardian ad litem may also be appointed where unborn or unascertained persons may eventually become entitled to an interest in the proceedings (SCPA § 315), or where a possible conflict of interest between a representative of the ward (such as a guardian) and the ward exists (SCPA §§ 315, 402). A guardian ad litem differs from a guardian of the person or the property under Article 81 in several respects. Most importantly, a guardian ad litem is appointed to act on behalf of the party under disability for the limited purpose of the matter before the court and not for the party's general care and welfare. Moreover, since the guardian ad litem is appointed to protect the person under disability in the context of the litigation before the court, the guardian ad litem must be an attorney admitted to practice in New York (SCPA § 404(1)). At the time of appointment, the guardian ad litem must file a consent to act and an affidavit affirming that he or she is qualified to protect the ward's rights, does not have a relationship with any of the parties, does not have an interest in the estate and does not have a conflict with the interests of the ward (SCPA §§ 402(1), 404). Once qualified to act, the guardian ad litem must take whatever steps are necessary to protect the interest of the person under disability. The final act of the guardian ad litem is to file with the court a report detailing his or her findings and recommendations (SCPA § 404(3)). In Surrogate's Court, guardians ad litem are appointed most frequently in will probate proceedings and proceedings to settle the accountings of executors, administrators and trustees. Other proceedings that involve appointment of guardians ad litem include: (1) compromise of wrongful death and personal injury actions; (2) adoptions; (3) applications for the disposition of real property; (4) construction proceedings under SCPA § 1420; (5) heirship proceedings; and (6) Mental Hygiene Law Article 81 proceedings. The guardian ad litem's fees are determined in a manner similar to the general process for setting attorney's fees. The statute provides that the guardian ad litem shall receive reasonable compensation for the services rendered (SCPA § 405(1)). Relevant factors in setting the fee include: the nature, extent and necessity of the services provided; actual time spent on the matter; the nature and complexity of the issues involved; the professional standing of the guardian ad litem; the results obtained in the case; the size of the estate; and the size of the interest of the ward in the estate.20 Typically, the guardian ad litem's compensation is paid from the estate or the interest of the person under disability (SCPA § 405). In determining the value of the guardian ad litem's services, the court reviews the time records supplied by the guardian ad litem. Our review of guardian ad litem appointments in Nassau County was limited by the recordkeeping procedures of the Surrogate's Court. The Nassau County Surrogate's Court assigns each case a number that stretches back in chronological order to that court's very first case in 1898. The number assigned, however, does not reference the year that the case was filed. As a result, the court was not able to supply us with a list of all matters that began in any particular year. Additionally, we were informed that, until the spring of this year, the court maintained no records of information pertaining to the appointments of guardian ad litem. The court did not keep a list of the guardian ad litem appointments made, the fees awarded to the guardians ad litem or the filings made to OCA. Accordingly, we were compelled to rely on records of guardian ad litem appointments contained in the OCA fiduciary database. We reviewed the listings in the OCA database of guardian ad litem notices of appointment for each of the last ten years. The number of recorded guardian ad litem appointments made in Nassau County between 1995 and 2000 averaged 255 per year. We selected for review all cases recorded in the OCA database in which a guardian ad litem appointment was made between January 1, 1998 and December 31, 1998, as our goal was to review recent cases but also those in which the guardian ad litem work's would have been concluded. The OCA database contained filings for 278 guardian ad litem appointments in 272 cases in Nassau County Surrogate's Court for calender year 1998. This included six adoption matters that could not be reviewed because the files had been sealed by the court. In addition, the court clerks were unable to locate eight other court files. Of the 258 cases we were able to review, the court files in two cases contained no information concerning a guardian ad litem. In six cases, the court appointed an additional guardian ad litem, and in one case the court appointed two additional guardians ad litem. Thus, we reviewed a total of 264 appointments. At the conclusion of our review of these appointments, however, we were informed by the clerk of the court that, in fact, the court had kept some records of guardian ad litem appointments. For the first time, we were informed that the practice of the court, for several years prior to 1999, had been to send a letter notifying all attorneys who had been appointed as guardian ad litem of their appointment. The court began to keep copies of these letters in October 1999. The court had copies of 42 letters sent to guardians ad litem concerning appointments during the period of October 1, 1999 to December 31, 1999. Of these 42 letters, seven were duplicates or pertained to cases the clerks could not find. We reviewed all 35 of the cases where the court had sent a letter to the guardian ad litem and the clerks could locate the file. The court also had 286 copies of letters sent to guardians ad litem in cases that originated in 2000. As we were unable to adequately establish the compliance with the Part 36 filing requirements in our review of appointments made in 1998, we examined the filings made by guardians ad litem in 2000. In addition to reviewing these cases, we also interviewed judges, court personnel and numerous fiduciary appointees. As noted, we had to rely on the OCA fiduciary database to identify cases in which guardians ad litem had been appointed. Thus, it was impossible to establish the level of compliance for filing the notice of appointment forms. We were, however, able to evaluate the number of certification of compliance forms that were filed (these are filed with the court but not with OCA). Our review of the 264 appointments made in 1998 found that 261 (99%) of the appointees had filed the certification of compliance form with the court. This finding of almost perfect compliance is tempered by the fact that the only appointments we were able to review were of guardians ad litem who had filed their notice of appointment forms, and the certification of compliance typically is filed contemporaneously with the notice of appointment. We were also able to evaluate compliance with the requirement that the court file a statement of approval of compensation form at the time the fiduciary is awarded a fee. We found that approval of compensation forms were filed in only 147 of the 264 cases (56%). We reviewed the 117 cases where the approval of compensation was not filed and found that in 34 of those cases, a statement of approval of compensation was in the court file, although only four of those forms were complete and signed by the court while the remaining 30 forms were not signed by the court. The 266 guardian ad litem appointments made in 1998 were awarded to 96 people, 95 of whom were on the OCA fiduciary list of eligible appointees. 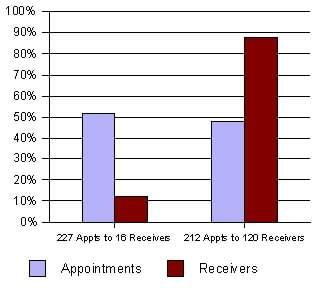 Over two-thirds of the appointees received only one or two appointments and small amounts of compensation. A smaller group of appointees, most of whom had some connection to the court--such as former interns --received almost half of the total appointments, although they also received relatively small fees. A third, even smaller, group received one or two very lucrative appointments. This small group that received lucrative appointments included two retired judges and the former head of the law department of the Surrogate's Court in a neighboring county. With the exception of one attorney, the appointees who received frequent appointments received no cases involving high fees, and the attorneys who received lucrative appointments did not handle the smaller cases. This finding is contrary to the widely-held perception that fiduciaries who take appointments for no fee or for a minimal fee are often rewarded with high-paying appointments. Throughout these years, the court's system of selecting guardians ad litem was as follows: if the value of the estate was greater than $1 million, the Surrogate would appoint the guardian ad litem without consulting his staff. If the value of the estate was less than $1 million, the chief clerk would recommend to the Surrogate a candidate for appointment and, with rare exception, the Surrogate would then appoint the recommended candidate. The nature of the case in which the guardian ad litem was appointed dictated the size of the fee the appointee received. In the majority of the cases we reviewed, a petition for probate of a will was filed with no objections. In these cases, the guardian ad litem's role was limited to a review of the validity of the execution of the will, resulting in a report to the court. If the guardian ad litem approved the probate of the will, he or she would not have to make an appearance before the court and the responsibilities generally were completed in ten hours or less. In these straightforward cases, the guardian ad litem's compensation was based on a schedule keyed to the size of the estate, and the guardian ad litem would not file an affidavit of compensation. But if the guardian ad litem sought a fee greater than that allowed by the schedule or greater than $2,500, he or she would file an affidavit of services. A total of 96 individuals received guardian ad litem appointments in 1998. Of that total, 65 (68%) received only one or two appointments. A much smaller group of 11 attorneys received over five appointments each for a total of 105 appointments. Three of these attorneys received over ten appointments each, with the largest number of appointments an individual attorney received being 20. The average compensation awarded was approximately $1,000 per appointment, usually for cases involving simple petitions for the probate of a will. We were unable to establish the size of the fees awarded to the guardian ad litem in 42 (16%) of the cases. Of the 222 cases in which the compensation was set forth in the case file, the total compensation awarded was $506,587. A group of 11 attorneys received 20 appointments with a total compensation of $237,352. These 11 attorneys received 47% of the total compensation awarded in 1998. One individual who was not on the OCA fiduciary list received five appointments in 1998, for which he earned a total of $8,600. None of the case files contained a written record of the reasons why he was appointed despite not being on the OCA list. The OCA database showed that between 1996 and 2000, this attorney reported 24 appointments from Nassau Surrogate's Court and $35,300 in compensation. The attorney stated that he was friendly with the court clerks and had performed legal work for some of the clerk's families. He also told us that, in the early 1990s, he had asked several of the clerks to give his wife guardian ad litem appointments. The OCA database reveals that his wife received 31 guardian ad litem appointments in Nassau Surrogate's Court between 1992 and 2000. We also reviewed the 35 cases identified in the letters that the court sent to guardian ad litem appointees in October, November and December of 1999. 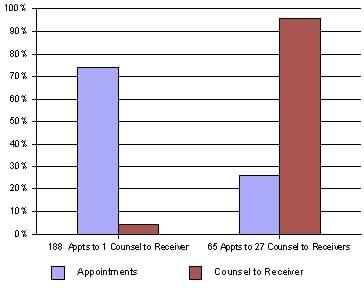 The 35 appointments were given to 24 attorneys, with 16 receiving a single appointment. The remaining eight appointees received a total of 19 appointments. We were able to determine the amount of the fees the guardians ad litem received in 33 of the 35 appointments, and a total of $63,450 in fees was awarded. In two of the cases, the guardians ad litem received no fees. The fees awarded ranged from $150 to $12,000, and the average compensation was approximately $2,000. Although it was an unusual and complicated proceeding, one case provides an example of how court appointees in Nassau Surrogate's Court frequently have close ties to the court and to each other. The case, which lasted for nearly five years and began as a will probate contest and later continued as an accounting proceeding, involved the appointment of two guardians ad litem, one assistant to the guardian ad litem, two counsel to the guardian ad litem, one special referee and one assistant referee. The total fees for the fiduciaries in the case were more than double the combined fees for all guardian ad litem appointments in all of the cases initiated in the court in 1998. The estate was valued at over $80 million, and the decedent was survived by a daughter, two granddaughters and several great-grandchildren. The decedent's final will and codicils specifically disinherited one granddaughter and her children. Several law firms were retained and actively litigated the probate of the will. The Surrogate appointed a retired Nassau County Court Judge as guardian ad litem for the great-grandchildren who were disinherited in the will, a retired Surrogate to act as special referee to oversee the discovery and daily case developments in the matter and an attorney as guardian ad litem for the great-grandchildren who had not been disinherited in the will. The retired County Court Judge informed us that, shortly after his appointment as guardian ad litem, he anticipated that as a solo practitioner the responsibilities of the case would be greater than he could handle alone, so he hired two attorneys to act as his assistants--his daughter, and the Nassau County Deputy Public Administrator. Because the former County Court Judge was retired from the bench, his hiring of his daughter was not barred by any existing rules or statutes. Nor is there any legal prohibition against a fiduciary appointee hiring a relative to assist in a case. Additionally, there is no bar against a guardian ad litem retaining the Deputy Public Administrator.22 Nevertheless, since the guardian ad litem needed assistance with the great amount of work he anticipated, his hiring of an attorney with a full-time government position is curious. Additionally, the Deputy Public Administrator had not only been appointed by the Surrogate, but he was the Surrogate's former court officer and a close personal friend. The former Surrogate, who was the special referee, was paid $250 per hour. The guardian ad litem's billing rate was $300 per hour, and his daughter's and the Deputy Public Administrator's rates were $200 per hour. The total fees awarded in the case were extensive. The guardian ad litem received $424,500. The billing records reveal that, over a two- month period in 1995, the Deputy Public Administrator billed for 167 hours of legal work over 22 days, or an average of almost eight hours per day. In all, the Deputy Public Administrator submitted affidavits of services detailing over 1,000 hours of work, for which he received approximately $215,000. The guardian ad litem's daughter received over $44,000. The retired Surrogate who was the special referee received $192,500, and his assistant received over $10,000. The guardian ad litem for the inheriting great-grandchildren and his counsel received over $500,000 in combined fees. All told, the combined fiduciary fees in the case were nearly $1.5 million. In Erie County, we reviewed a random sample of 50 cases in which 60 guardians ad litem were appointed during the period January 1, 1995 through December 31, 1999. A review of these cases revealed that all of the certificate of compliance forms and 47 (78%) of the notice of appointment forms were filed. In addition, 52 of 55 (95%) statements of approval of compensation were filed. A review of the court files, however, showed that the notice of appointment forms, the court orders appointing fiduciaries and the court's records concerning the appointments often had different appointment dates recorded. This creates confusion regarding the actual date of appointment and makes it more difficult for appointees to comply with the rules. We notified the court about this problem, and the court has now corrected its procedure to ensure that consistent and correct dates are recorded. Our review of guardian ad litem fees was difficult because in a majority of cases the amount of compensation was determined by the litigants, not the court. The Surrogate told us that his longstanding policy was to approve the fees that the parties agreed upon unless they "shocked the conscience." Typically, if the parties did not prepare an affidavit of services, the court did not request one. The standard hourly fee requested was generally within the range of $125 to $175. One guardian ad litem was awarded $18,000. Later the same month, he received a second appointment for which he was compensated over $61,000, and less than eight months later he received another appointment for which he earned $18,000. A guardian ad litem was appointed and received over $16,000. Less then five months later, he received another appointment for which he was paid over $26,000. Another guardian ad litem received an appointment for which he earned almost $10,000, and was shortly thereafter appointed in another case in which he earned over $17,000. In Westchester County, we reviewed a random sample of 25 cases. Of this sample, 23 of 27 guardians ad litem (85%) filed a notice of appointment, and 26 of 27 (96%) filed a certification of compliance. The court filed approval of compensation forms for 19 of 22 (86%) appointees. It appears that one of these attorneys received appointments in violation of the $5,000 rule. We also reviewed a random sample of 25 cases in Monroe County. 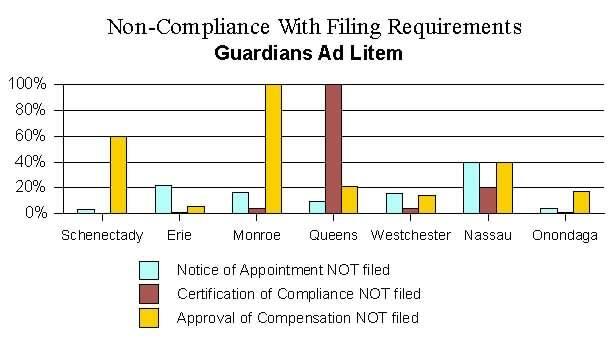 Our examination revealed that 21 of 25 guardians ad litem (84%) filed a notice of appointment, and 24 of 25 (96%) filed a certification of compliance. The court, however, had filed no approval of compensation forms since October 1993. The chief clerk explained that this was an oversight possibly related to the court's revamping of its case management system. We also selected a random sample of ten cases in which guardians ad litem had been appointed and determined that five of the appointees were not included on the OCA fiduciary list. The court files, however, contained no indication that the court had provided a reason for selecting an appointee who was not on the OCA list. In one case that came to our attention involving a sizeable estate, a guardian ad litem was awarded $4,000 for 3.75 hours of legal work. Our random sample of 25 cases in Queens County revealed that all of the appointees had filed a certification of compliance, 30 (91%) had filed a notice of appointment and 26 (79%) approval of compensation forms had been filed. It appears that at least three individuals were appointed in violation of the $5,000 rule. One received four guardian ad litem appointments within a 12-month period in which she earned $7,500, $10,500, $7,500 and $31,500, respectively. Another received three appointments within a five-month period in which he earned $11,500, $8,500 and $27,500, respectively. Our review of 25 cases in Schenectady County revealed that all of the guardians ad litem filed a certification of compliance form and all but one filed a notice of appointment. However, approval of compensation forms were filed for these appointees in only 40% of the cases. 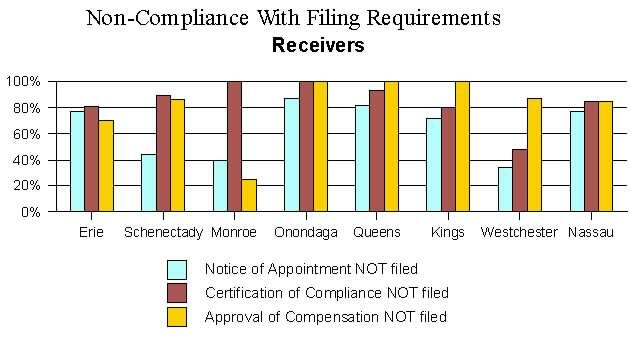 Similarly, in Onondaga County, all appointees filed a certification of compliance form and only one failed to file a notice of appointment form. Approval of compensation forms were filed for 83% of these appointees. As this Report makes abundantly clear, the fiduciary appointment process in New York is in need of reform. We have documented a wide range of problems that regularly arise in these cases in courts throughout the State. In doing so, we have confirmed the validity of many of the public criticisms concerning the fiduciary process. request has been examining the appointment process, has completed its own review and is about to release its report and recommendations. The recommendations will include, among other things, proposals to strengthen eligibility and qualifications for fiduciary appointment, tighten restrictions on the number of appointments that individual fiduciaries may receive and upgrade oversight of the appointment process. If implemented, these recommendations will lead to significant improvements in the existing system. Second, court administration already has taken major steps to correct the flaws we found in the fiduciary filing process. Last Spring, a new oversight system was implemented, in which special fiduciary clerks have been appointed in every Judicial District. Reporting directly to the District Administrative Judges, the fiduciary clerks serve as the clearinghouse for all forms appointees and judges are required to file with OCA, and they will be monitoring the OCA fiduciary database to verify that information concerning who is receiving appointments and how much they are paid is entered accurately. The goal is to ensure that all forms are properly filed in every single case in which a fiduciary is appointed and that no fiduciary appointee is paid unless he or she has filed the necessary forms. Third, in cases in which we have uncovered clear violations of the fiduciary rules or ethical standards, Chief Administrative Judge Lippman has referred individuals to appropriate disciplinary authorities. We have every expectation that these referrals, and any future referrals that may be made, will send an unmistakable message to the bar and bench that violations of the fiduciary rules will not be tolerated. Finally, our work does not end with this report. In establishing the Office of the Inspector General for Fiduciary Appointments, Chief Judge Kaye made clear that the office will be a permanent entity within the court system. Together with OCA's Internal Audit Unit, our examination of fiduciary appointment practices throughout the State is ongoing. We will continue to identify problems in this process and recommend that individuals be referred to relevant disciplinary authorities, as appropriate. Moreover, in the coming months, we will help to ensure compliance with the rules, monitor the effectiveness of the reforms, and assist the bench and bar in meeting their responsibilities in regard to fiduciary appointments. In light of recent disclosures alleging that appointments of persons to perform services for receivers have been made based upon political considerations, we want to ensure, to the extent those practices may exist, that such appointments are made in conformity with court rules that are designed to remove favoritism from this appointment process. It appears that some of you may not be aware of how these court rules apply to appointments of persons to perform services for receivers, and it is important that everyone understands and properly applies our existing rules while the newly appointed Commission studies the entire fiduciary appointment process. Part 36 of the Rules of the Chief Judge [22 NYCRR], governing certain designated fiduciary and fiduciary-related appointments by judges, sets forth special procedures and restrictions in the making of these appointments -- including selection from lists of applicants, limitations on the number of substantial appoint-ments, prohibition of appointment of relatives of judges, and pre- and post-appointment certification and reporting obligations of the appointee. A copy of Part 36 is attached. Section 36.1(a) expressly applies these requirements to the appointment of persons designated to perform services for a receiver (which include attorneys, agents, appraisers, auctioneers and accountants), and it requires that the court, and not the receiver, make these appointments and do so in accordance with these procedures and restrictions. Your orders appointing receivers should conform to these requirements. We expect to be issuing shortly additional memoranda addressing in more detail the requirements and logistics of Part 36 to make sure that they are not inadvertently overlooked. cc: Hon. Joseph J. Traficanti, Jr.
(a) All appointments of guardians, guardians ad litem, court evaluators, attorneys for alleged incapacitated persons (under Article 81 of the Mental Hygiene Law), receivers, persons designated to perform services for a receiver and referees shall be made by the judge authorized by law to make the appointment upon evaluation by that judge of the qualifications of candidates for appointment. The appointing judge may select the appointee from the list of applicants established by the Chief Administrator of the Courts pursuant to section 36.2(a) of this Part. Except for the appointment of court evaluators, should the appointing judge decide that a person or institution not included on the list of applicants is better qualified for appointment in a particular matter, either because of prior experience with the ward or estate, or because of particular expertise necessary to the case, the judge may appoint that person or institution, and in such instance shall place the reasons for such appointment and the qualifications of such appointee on the record. The appointing judge shall be solely responsible for determining the qualifications of any appointee. (b)(1) No person shall be appointed who is a relative of, or related by marriage to, a judge or housing judge of the Unified Court System of the State of New York, within the sixth degree of relationship. This provision shall apply only to known relatives of judges and not to the professional associates of those relatives. (2) No person serving as a judicial hearing officer pursuant to Part 122 of the Rules of the Chief Administrator shall be appointed in actions or proceedings in a court in a county where he or she serves on a judicial hearing officer panel for such court. (3) No person shall be appointed who is a full-time or part-time employee of the Unified Court System. (c) No person or institution shall be eligible to receive more than one appointment within a 12-month period, calculated from the date of appointment, for which the compensation anticipated to be awarded to the appointee exceeds the sum of $5,000, except that where the appointing judge determines that unusual circumstances of continuity of representation or familiarity with a case require an appointment for which compensation would exceed that permitted by this subdivision, the judge may make such appointment and must set forth in writing the reason for the exception. (d) A prospective appointee whose appointment is subject to these rules shall certify in writing to the appointing judge, prior to the acceptance of the appointment, that the appointment will not be in violation of these rules. The certification shall include a statement that the appointment will be in compliance with subdivisions (b) and (c) of section 36.1 of this Part and shall include a list of all previous appointments received within the preceding 12 months. The certification shall be placed in the case file. (vii) a physician whose appointment as a guardian ad litem is necessary where emergency medical or surgical procedures are required. (f)The reporting and certification requirements set forth in sections 36.1(d), 36.3(a) and 36.4(c) of this Part shall not apply to the appointment of a referee whose compensation for such appointment is not anticipated to exceed $550. (a) The Chief Administrator of the Courts shall provide for the application by persons and institutions seeking appointment as guardians, guardians ad litem, court evaluators, attorneys for alleged incapacitated person, receivers, persons designated to perform services for the receiver, and referees. The Chief Administrator shall assemble such applications and shall maintain and make available for use by the appointing judge lists of applicants for appointment. (b) The lists maintained by the Chief Administrator shall contain such information as will enable the appointing judge to be apprised of the background of the applicants set forth therein. The lists may be maintained by court, county, judicial district, judicial department or combination thereof, and may be differentiated by type of appointment and area of special expertise. (a) Every person and institution receiving an appointment pursuant to this Part shall file a notice of the appointment with the Chief Administrator of the Courts, in a manner to be prescribed by the Chief Administrator, within 10 days of receipt of notice of the appointment. Such notice shall be a public record. The appointee also shall certify in writing to the appointing judge that the notice of appointment has been filed. The Chief Administrator shall arrange for the periodic public publication of the names of all persons and institutions appointed by each appointing judge in appropriate law journals and periodicals. (b) No later than March 31 of each year, the Chief Administrator shall report in writing to the Chief Judge of the operation of the procedures set forth in this Part, including recommendations for modification. A copy of each report shall be transmitted to the members of the Court of Appeals and the Administrative Board. (a) Fees to appointees pursuant to this rule shall not exceed the fair value of the services rendered. (b) Each award of fees of $2,500 or more to appointees pursuant to this section shall be accompanied by an explanation, in writing, of the reasons therefor by the judge making the award. (c) No fees shall be awarded unless the appointee has filed the notice of appointment and certification of compliance required by section 36.3(a) of this Part. The Chief Administrator or the appointing judge may require that applicants for appointment complete designated courses or training curricula prior to receiving an appointment. PERFORM SERVICE FOR A RECEIVER. PURSUANT TO PART 36 OF THE RULES OF THE CHIEF JUDGE. WAS FILED WITH THE OFFICE OF COURT ADMINISTRATION. Item 1 Enter the specific title of the court, e.g., Supreme Court, Surrogate's Court, etc., and enter the name of the county in which the appointing court is located. Enter name and mailing address of Appointee. Enter social security number of Appointee. Check appropriate box If "other," please specify, e.g., physician, accountant, etc. Appointee's firm name must be entered here regardless of whether a member, partner, associate, counsel or employee and regardless of whether any fee or allowance received is to be retained or is to go to the firm. Enter firm's Internal Revenue Service Federal Employer's Identification Number. Where no number is available, enter "None". Item 3 Enter date of appointmentmonth, day and year. Item 4 Enter either the docket, file, index number or any other identification assigned by the court to this matter. If there is no number assigned, enter "None". Item 5 Enter the title of the action or proceeding in which appointed, e.g., Smith v. Jones, Matter of Adams, etc. Please limit the title to 25 spaces. If it is a multiparty action, name only the first party, e.g., Smith et al. v. Jones et al. Item 6 Enter the first initial and full last name of the judge or justice who made the appointment. If made by the judges of a multi-judge court, enter "the Court." Item 7 Enter the name of the person or interest represented. If there are multiple parties, enter the specific name of the client. If appointee represents all plaintiffs or defendants in a mufti-party case, state "all plaintiffs". If appointee represents the court, state "the Court". Please limit entry to 15 spaces. Item 8 Check the appropriate box for the nature of appointment. IMPORTANT: The Notice of Appointment must be filed with the Office of Court Administration at the above address no later than the first business day of the week following appointment. A copy must be file with the appointing judge. c) date of appointment, d) title of proceeding and case index number. b) Receipt of this appointment will not give me more than one appointment within the prior 12 months for which the compensation was or is anticipated to exceed the sum of $5,000.00. This certification must be submitted to the appointing judge prior to accepting any appointment. This certification is a permanent record and must be placed in the court file. Enter firm's Internal Revenue Service Federal Employer's Identification Number. Where no number is available, enter "None". Item 3 Enter either the docket, file, index number or any other identification assigned by the court to this matter. If there is no number assigned, enter "None". Item 4 Enter the title of the action or proceeding in which appointed, e.g., Smith v. Jones, Matter of Adams, etc.If it is a multiparty action, name only the first party, e.g. Smith et al. v. Jones et. Al. Item 5 Enter the first initial and full last name of the judge or justice who made the appointment. If made by the judges of a multi-judge court, enter "the Court." Item 6 Enter the name of the person or interest represented. If there are multiple parties, enter the specific name of the client. If appointee represents all plaintiffs or defendants in a multi-party case, state "all plaintiffs". If appointee represents the court, state "the Court". Item 7 If you have received any other appointments within the previous 12 months, attach a separate page listing appointments. Include a) court of appointment, b) type of appointment, c) date of appointment, d) title of proceeding and case index number. Item 8 Date, sign and submit to the appointing Judge. If you have a problem completing this certification, contact the appointing Judge immediately. It is with great unhappiness that we must inform you that we hereby resign our positions as members of the Kings County Democratic Law Committee. It has became apparent that our diligent work and unquestioned loyalty to the Organization over the many years are clearly not as important as the desires of Mr. Ravi Batra. Although, Mr. Batra holds no party or elected position in our County, he has nevertheless, imposed himself on the political workings of our Organization for the sole purpose of his own personal financial gain. Therefore, we will be unable to continue to represent candidates for elected and/or judicial office free of charge, as we have done so in the past. One cannot reasonably expect our firm to continue to avail to the Orga nization our professional services while the Organization sits idly by and permits Mr. Batra to maliciously injure our practice and reputation without consequence. As I am sure that the facts surrounding our termination as Mr. Batra's attorneys on his numerous Court appointed Receiverships will be discussed by many members of our Organization, we feel it is now necessary to clarify the issues surrounding our recent termination. As you have been made aware, on December 7, 1999, Mr. Batra, via facsimile correspondence, terminated our firm as his attorneys on all of his many Receivership matters: including the representation of Mr. Batra with respect to his Receivership of the Cypress Hills Cemetery. It must be clearly noted that Mr. Batra stated in his termination letter of December 7, 1999, that his own firm will now represent him on all Receivership matters. Mr. Batra claims that our firing was as a result of our firm's lack of competent legal representation. As you can personally attest, our firm is well recognized as an authority in the area of Receivership law. I can assure you that any such claims are merely a transparent attempt to deflect attention from Mr. Batra's true motive of obtaining both the legal fees generated from these matters in addition to collecting a Receiver's commission from said cases. It is indisputable that our firm has done an excellent job in protecting the interests of our clients, a fact that can be attested to by many members of our own Organization. I must reiterate that Mr. Batra is merely attempting to secure legal fees for his own firm while continuing to collect commissions on these matters as well. Although, we have the utmost respect and affection for you and the excellent work you have done as the Law Chairman, we are left with no alternative but to resign as members of the Law Committee. To continue on in our capacity as Law Committee members in light of Mr. Batra's inexcusable actions would be far too much to expect, given the fact that the Organization has permitted an individual with no party position or history in this County to dictate how our Organization is run. As Law Chairman you are well aware of the fact that Mr. Batra has never assisted the Law Committee on any level whether it be collecting signatures, binding petitions or trying an election law case, etc. In fact, it is unknown as to what Mr. Batra has accomplished in any capacity to benefit our Organization. I cannot stress to you enough the sense of betrayal we presently are experiencing. Clearly, you recognize the unwavering loyalty and dedication our firm, as well as that of our predecessors, have shown to this Organization over the course of the past twenty five (25) years. It is unprecedented and disheartening how one man's greed and self absorption can go unchecked. Simultaneously, such an act reduces the credibility of the once most powerful political organization in the nation, to an Organization that permits unprovoked attacks by an outsider without consequence. It is unfathomable that such action would be tolerated by any other political organization within this City or State. It is quite evident that permitting Mr. Batra's behavior has severely damaged our credibility and reputation as a political Organization. We hope that one day in the not so distant future we will be able to work together again when the interests of the Organization are once again paramount to the unfettered demands of one non-contributing individual. cc: Hon. Clarence Norman, Jr.
1 The sixth degree of relationship extends to second cousins. 2 Last year, the Legislature raised the threshold for filing from $200 to $500. 3 A community guardianship program is a non-profit organization that has contracted with a social service agency to provide guardianship services to certain eligible incapacitated persons. 4 See Matter of St. Luke's-Roosevelt Hospital Center (Marie H.), 89 N.Y.2d 889 (1996). 5 See Matter of Freeman, 34 N.Y.2d 1 (1974); Matter of Potts, 213 A.D. 59, 62 (4th Dept. 1925), aff'd 241 N.Y. 593 (1925). 6 The community guardianship program's compensation is paid from the IP's assets, and is based upon the cost incurred by the program in providing the services or the fee that would otherwise be awarded by the court, whichever is less. 7 See, e.g., In re Pineda, N.Y.L.J., May 28, 1997, p. 26 (Sup. Ct., New York Co.); In re Schwartz, N.Y.L.J., May 2, 1996, p. 33 col. 2 (Sup. Ct., Nassau Co.). 8This was a non-paying, periodic assignment in which the attorney, on behalf of the judge, reviewed motion papers and attempted to expedite matters. 9 Because a court evaluator is appointed to recommend whether the AIP needs a guardian, once a guardian is appointed the court evaluator's services generally are no longer required. 10 Among the fee requests that the judge had approved was a bill that the guardian had submitted that included 42 hours of work for in single day. The improper billing was discovered by the family's attorney upon his review of the guardian's affirmation of services. The overpayment of $12,600 was subsequently returned. 11 This includes the fee received by counsel to the AIP. 12 See Strober v. Warren Properties Co., 84 A.D. 2d 834 (2d Dept. 1981). 13 See Lentine v. Fundaro, 56 A.D. 2d 592 (2d Dept. 1977). 14 A copy of the letter is attached to this Report (see Attachment B). In their letter, the attorneys announced their resignation from their positions as members of the party's Law Committee, but not from their positions as officers in the county Democratic organization. 15 Given the incompleteness of the court files, the amount of compensation earned by fiduciaries in these cases may well be higher than what we have been able to document in this report. 16 Several people have informed us that for a number of years the Brooklyn Democratic organization provided judges assigned to the Ex Parte Part (where the overwhelming number of receivership appointments are made) with a list of "recommended" fiduciary appointees. Those on the list were all active in Brooklyn Democratic politics. We were informed that this practice ended several years ago in the wake of rumors of a federal criminal investigation. 17 Garry & Ludwig apparently was able to learn of the appointment of a receiver before the receiver was notified of the appointment. Acting on behalf of another law firm that represented one of the leading mortgage lending institutions in Brooklyn, Garry & Ludwig frequently would file with the Ex Parte Clerk's Office the bank's applications for the appointment of a receiver. The firm thus would learn from the clerk's office when a receiver was appointed, and then would notify the appointee. This arrangement obviously facilitated the firm's retention as counsel to the receiver in many cases. 18 Notably, in Lentine v. Fundaro, 56 A.D.2d 592 (2d Dept. 1977), the court found upon its review of the fee request made by the counsel to the receiver that counsel spent time on tasks that the receiver should have performed, such as telephone calls and letter writing. In reducing the fees awarded to the counsel and to the receiver, the court held that receivers must perform services to earn their commission, and if those services are performed by others then the receiver's commission should be reduced. 19 Selection of these cases was significantly hampered by the Erie County Supreme Court's lack of a reliable method of identifying foreclosure cases in which receivers are appointed. 20 19. See, e.g., Matter of Will of Slade, 99 A.D.2d 668 (4th Dept. 1984); Matter of Springett, 35 A.D.2d 927 (1st Dept. 1970); Matter of Burk, 6 A.D.2d 429 (1st Dept. 1958); Matter of Potts, 213 A.D. 59 (4th Dept. ), aff'd 241 N.Y. 593 (1925). 21 As noted, the court also had copies of 286 letters sent to guardians ad litem in 2000. At the time of our review, many of the appointees in these cases had not completed their duties, and thus the case files did not contain the report of the guardian ad litem or any information on compensation. Therefore, we limited our review to the examination of the filings of the notice of appointment forms. We compared these 286 letters to the information provided by OCA's database and found that notices of appointment had been filed in 229 (80%) cases. In the cases in which a notice of appointment was filed, the court clerks were unable to locate six of the court files. In 38 of the 51 cases reviewed, the notice of appointment was in the court file. In four of the cases, a guardian ad litem had never been appointed and in nine of the cases the court file did not contain the notice of appointment. 22 The Office of the Public Administrator manages estates in which no appropriate person is available to act as administrator. Although the Deputy Public Administrator is a full-time county employee, employees of the Nassau County Public Admininstrator's office are not prohibited from practicing law outside of their county employment.